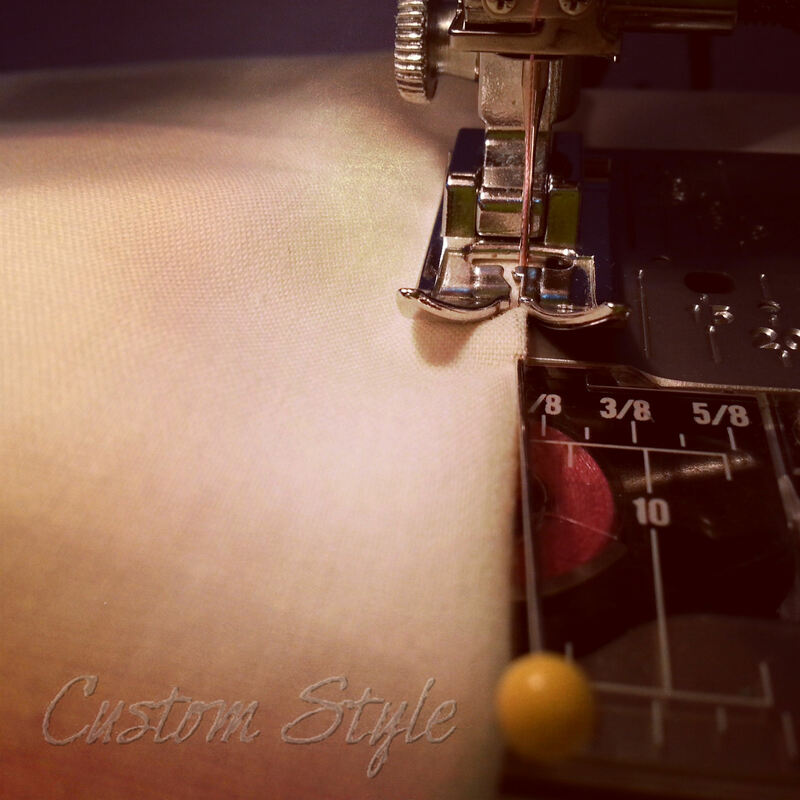 Have you ever wanted to know the fabric content of some unidentified yardage? Well, pull out a lighter, light a candle, and figure out what that mystery fabric is! Today the topic was fabric fiber content and burn testing, so I made a few videos on Instagram yesterday in preparation. Smells like a campfire (leaves and paper) while burning. Cotton fabric after being burned. Stinks like burning hair or feathers. 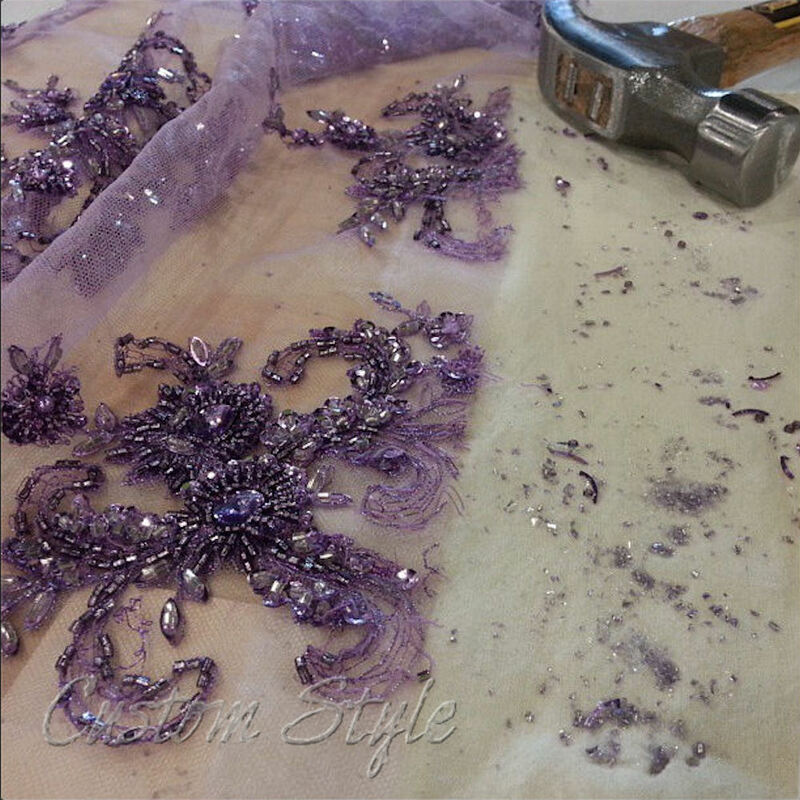 Silk fabric after being burned. Linen fabric after being burned. Smells even worse than silk. Really strong burning hair smell. Like Bantha fodder. Wool fabric after being burned. Has a slightly sweet chemical smell. It is man-made after all. 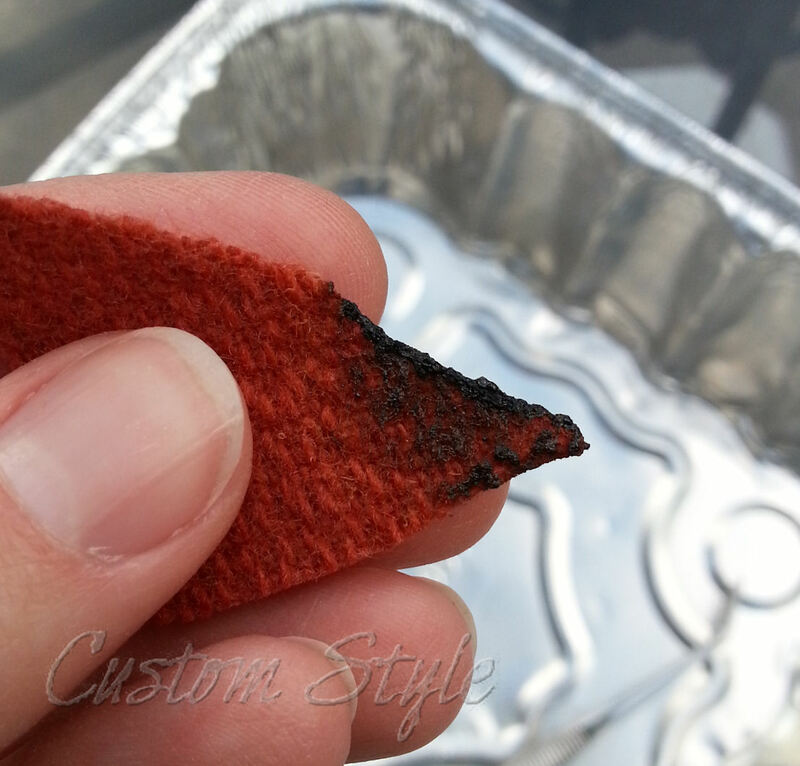 Polyester fabric after being burned. Melts more than burns. Has a bitter chemical odor. Attracts nosy little dogs. 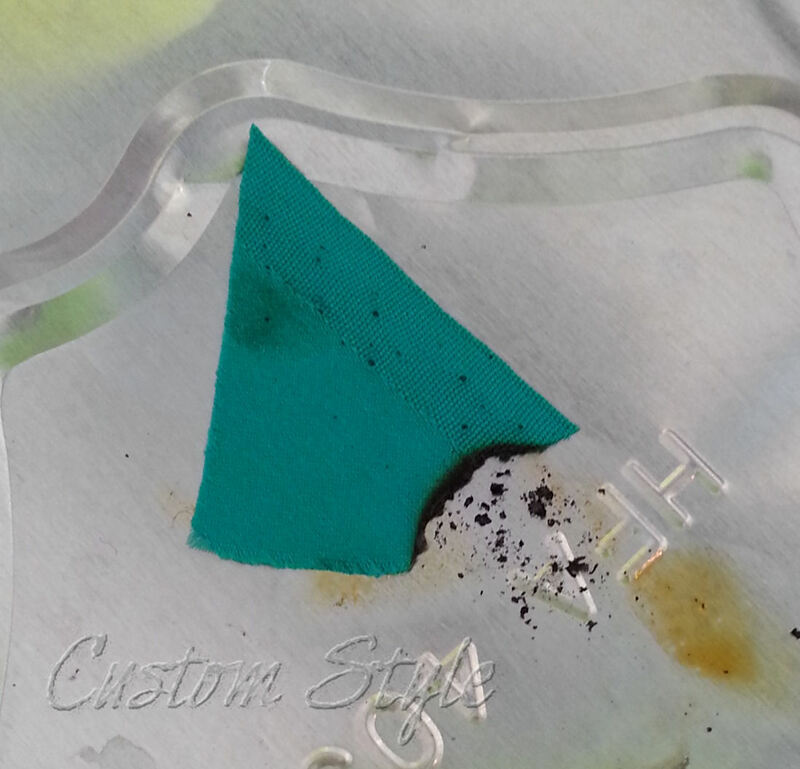 Spandex fabric after being burned. Not usually included on a burn chart, but I wanted to see how it behaved in comparison to cotton and polyester separately. 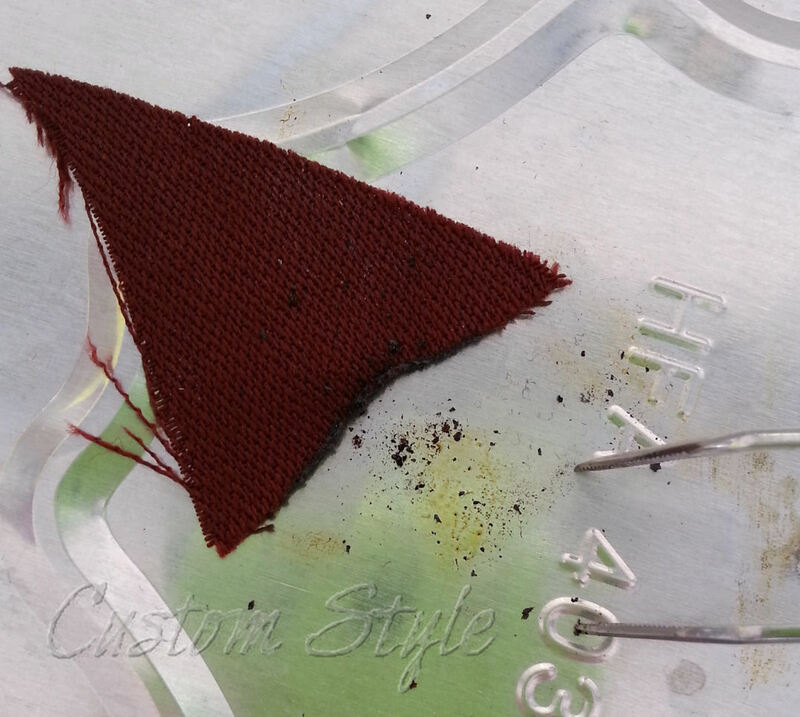 Blends are usually the hardest to identify because they burn in such a variety of combinations. I find it interesting that the cotton-poly ignited so quickly. The melting polyester seemed to hasten the cotton’s burn time. 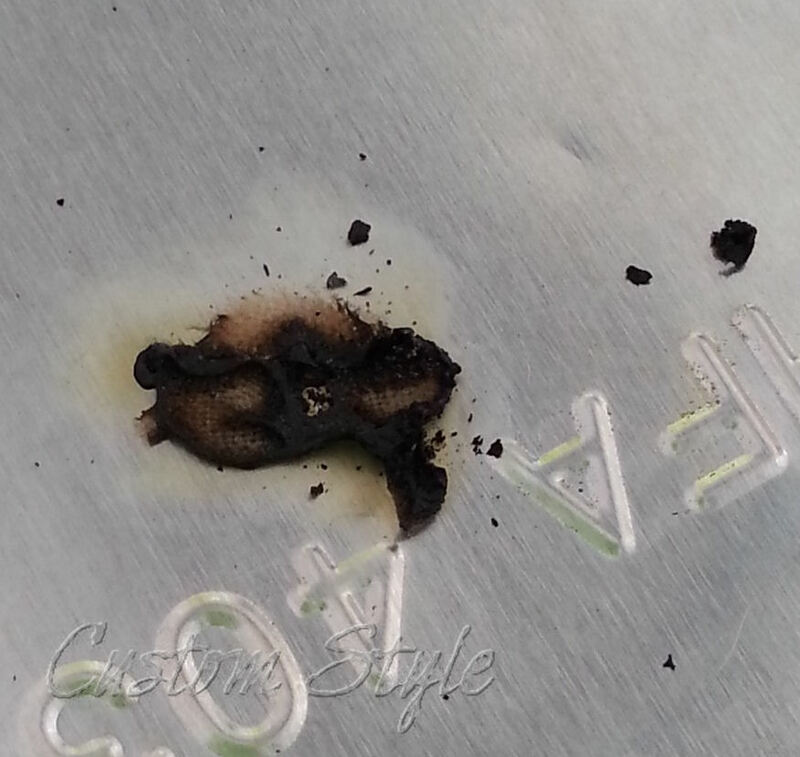 Instead of slowly burning into an afterglow as cotton does, it just shriveled up in a fast flame in the metal pan. 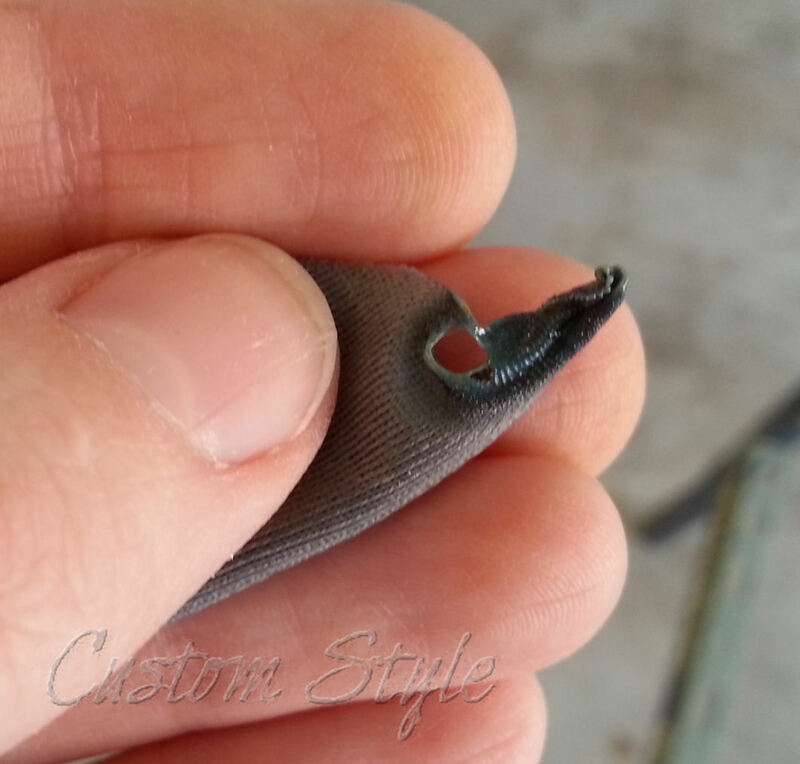 The burned fabric became both brittle ash and hard plastic at the same time. 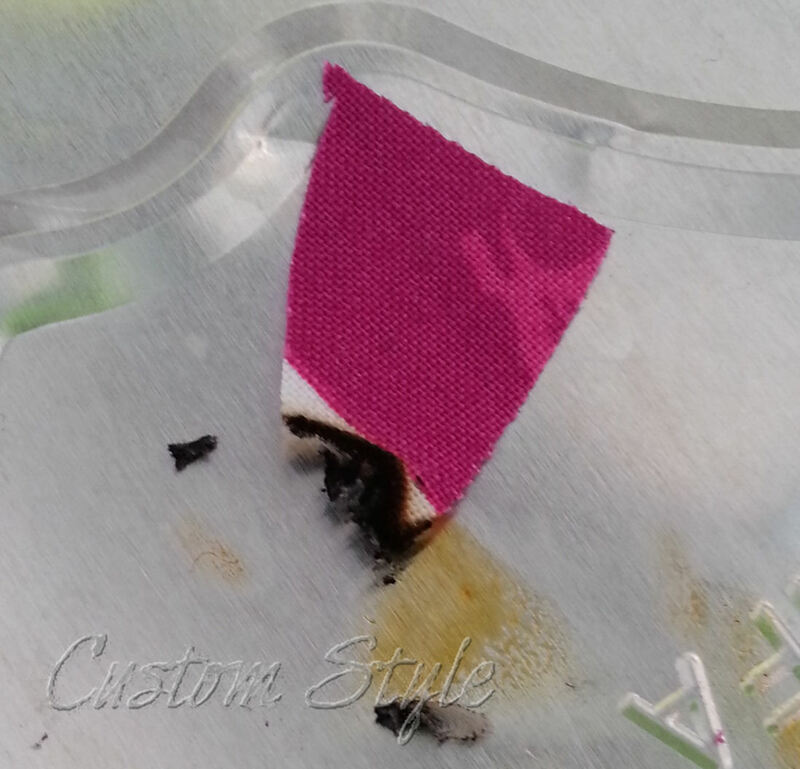 Cotton-polyester fabric after being burned. So if your “cotton” fabric curls up as it burns and smells a little sweet, there’s a good chance it contains some polyester. Since I knew what it was, I decided to see how this blend burned. It was nasty smelling. Eww ick. Like Solo’s tauntaun. Probably the worst smelling of everything I burned. The wool-poly melted on the edge and on the bottom where it was touching the flame. Definitely smelled like a wool but melted like a polyester. Smells like vinegar when burned. Melts and burns. Both burn similar to cotton because they are semi-synthetic. They are what I call the “bologna” of fabric because they’re processed from wood pulp. Thus, they also smell like campfire. Sputters and melts as it burns. It has a chemical smell similar to broiled fish. Melts but doesn’t really burn. 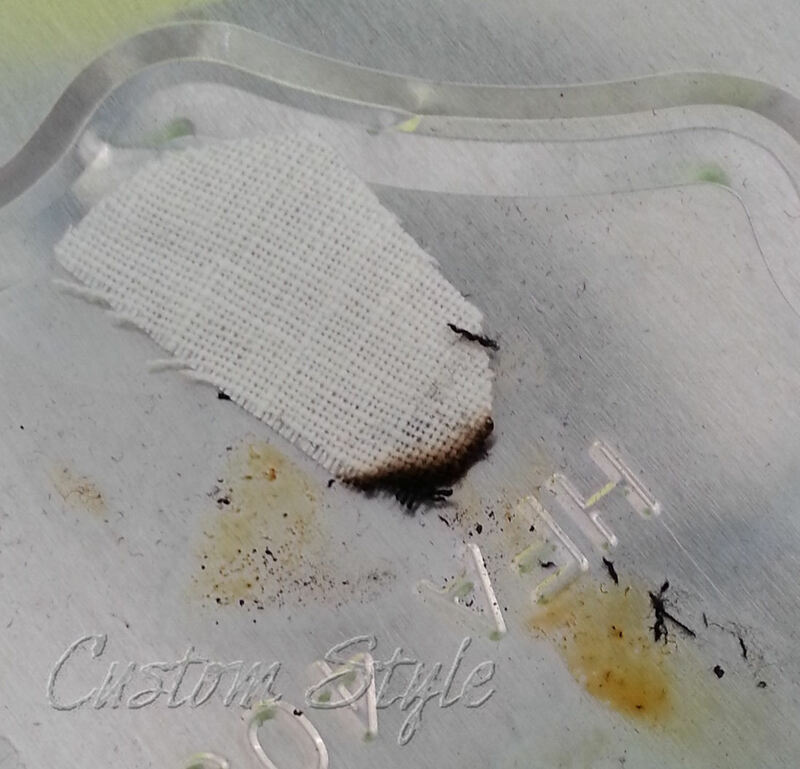 When I burned some white nylon I had at one time, I remember it not even turning black. It just melted into a hard plastic. It smells like celery or boiling green beans. 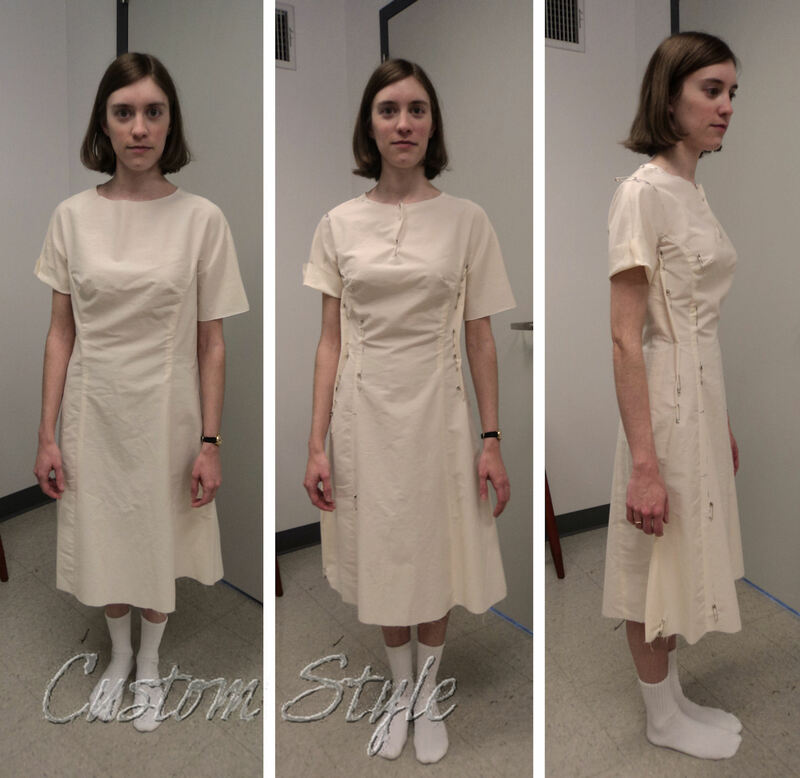 Hopefully, you found the video examples of the burn tests useful and will now be able to better identify some of those mystery fabrics in your stash. Like that sample of uniform from that army officer of Gilder. 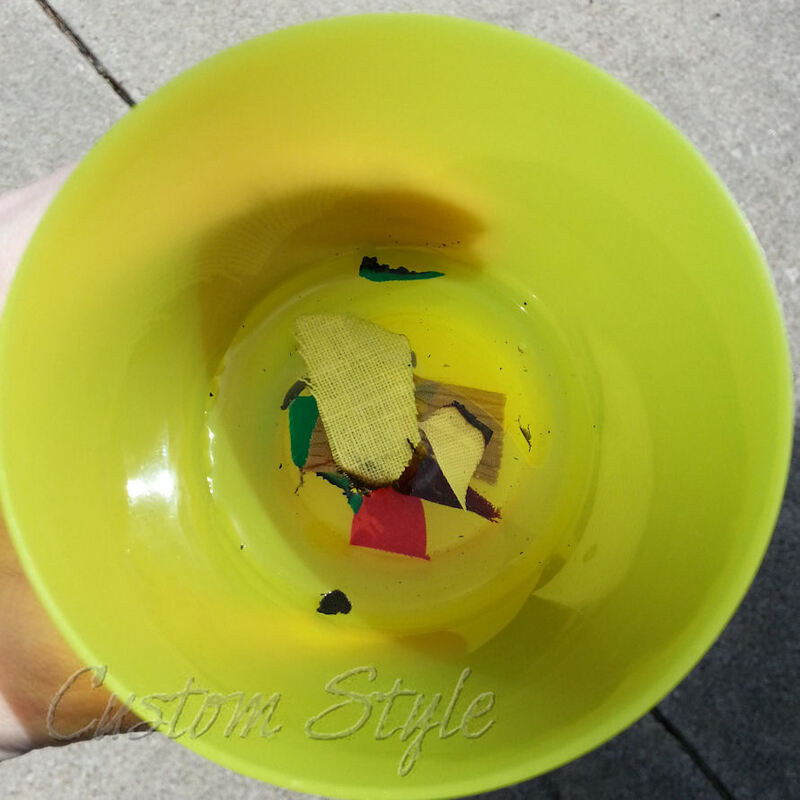 Burned fabrics in the cup of water I used to dispose of the scraps during the test. 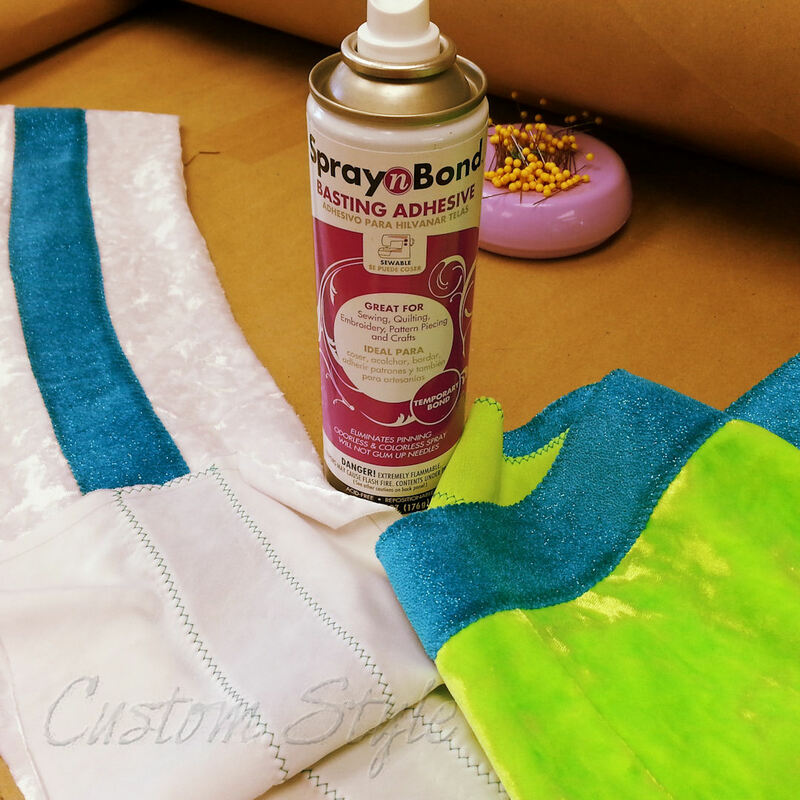 Next Friday’s #FabricChat topic is “how to paint fabric” if you’d like to join in. Sadly, I will be working, but I look forward to reading the archived chat on Leila’s blog. 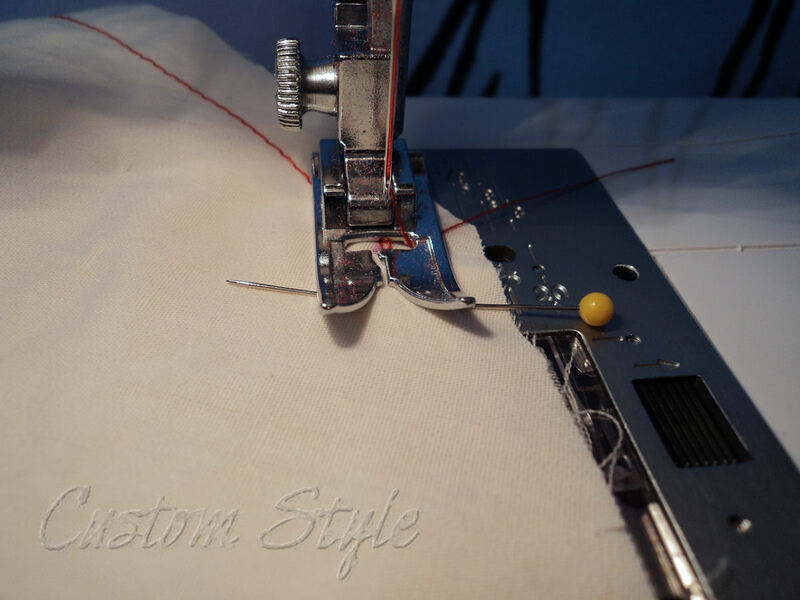 Sewing inset geometric shapes like rectangles & triangles (aka godets) can be intimidating and confusing at first glance, but they are nothing to be afraid of! 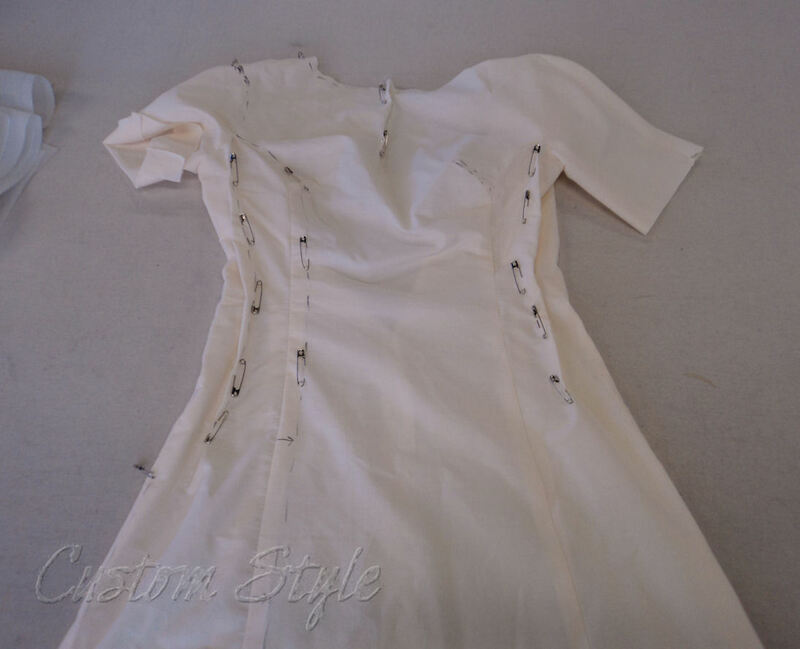 You need to completely disregard pattern instructions when it comes to point sewing, because they just make it more complicated than necessary. 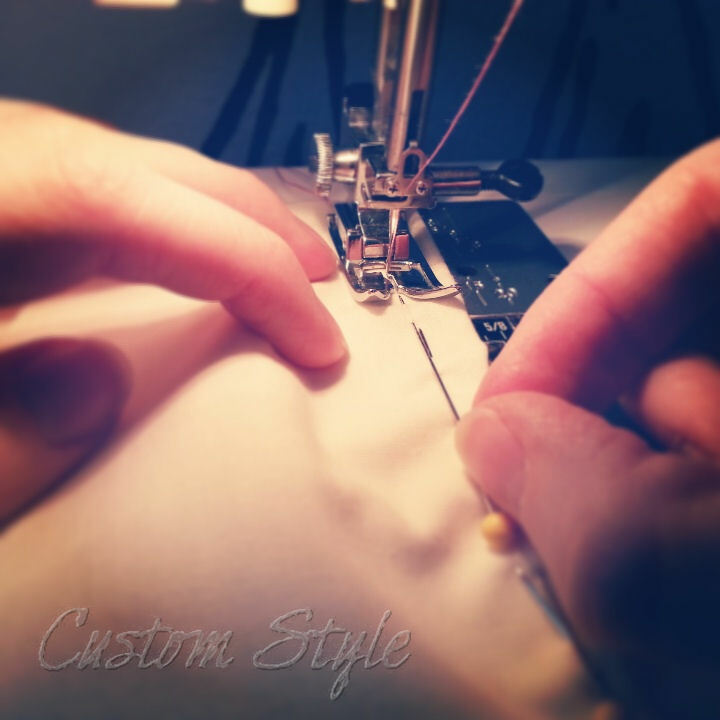 I’ll demonstrate the simplest way to sew inset points with a short picture guide, and you might even find yourself drawn to the challenge of point sewing! 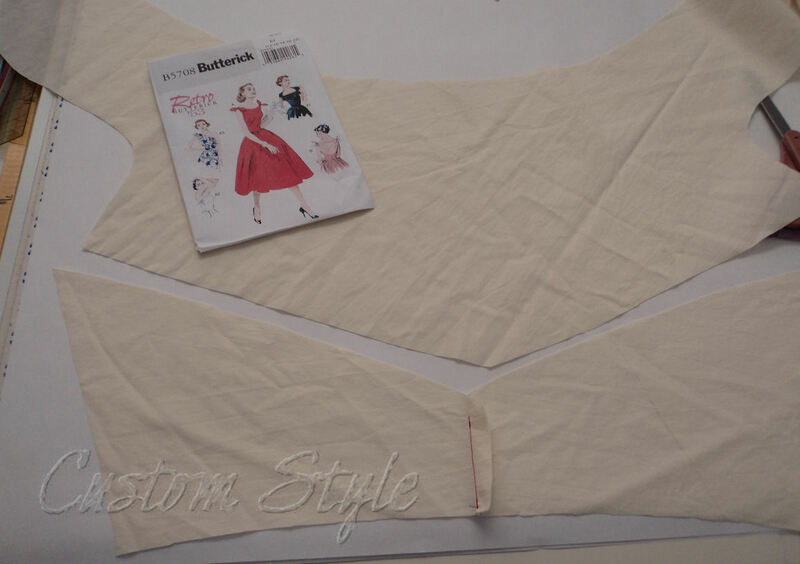 I recently took some photos of the process of point sewing while demonstrating it to a friend, who was making herself a dress using retro Butterick 5708, which has a V-shaped seam pointing down under the bust in both front and back. 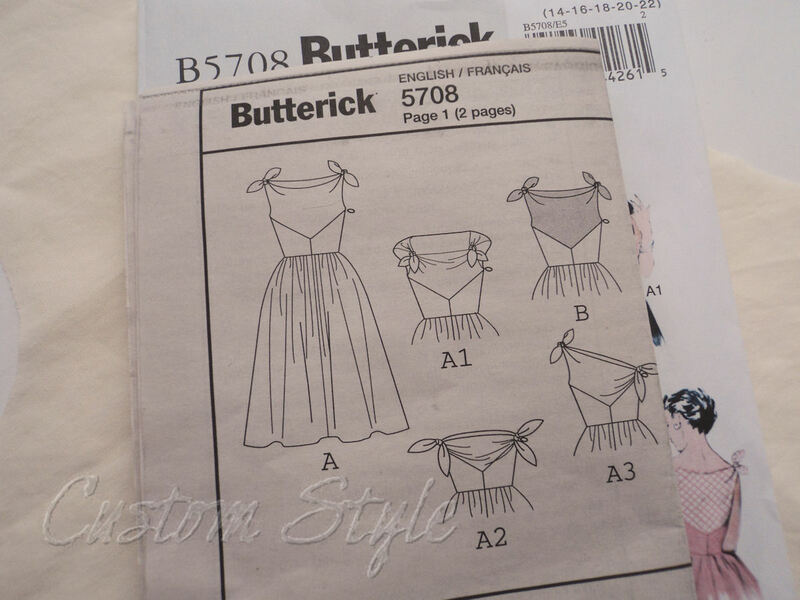 Technical line drawing of Butterick 5708. 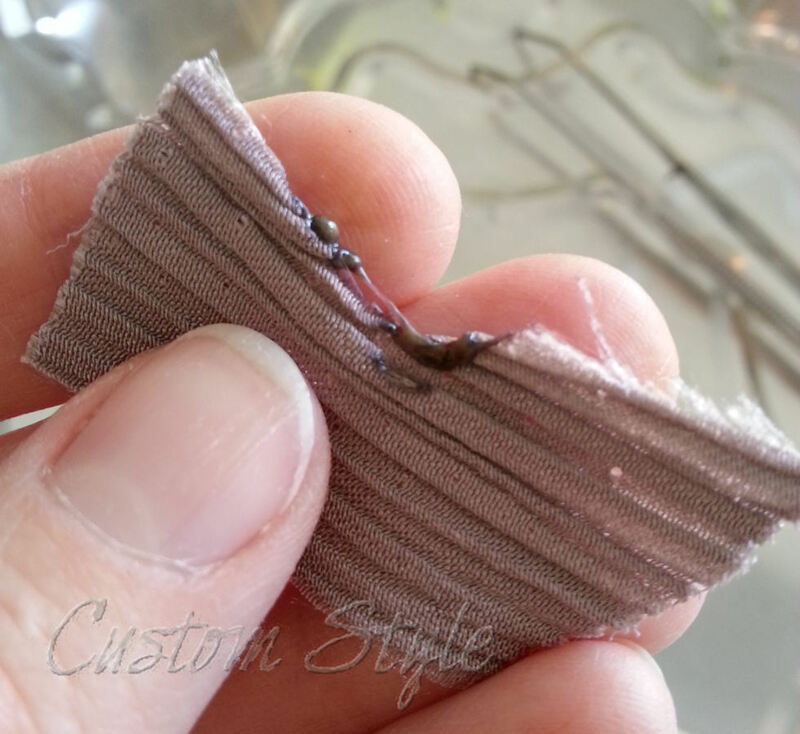 In most situations, it’s best to first stitch together any straight seams that join to a pointed piece. I find it easiest and the most likely to produce a precise point in the end. 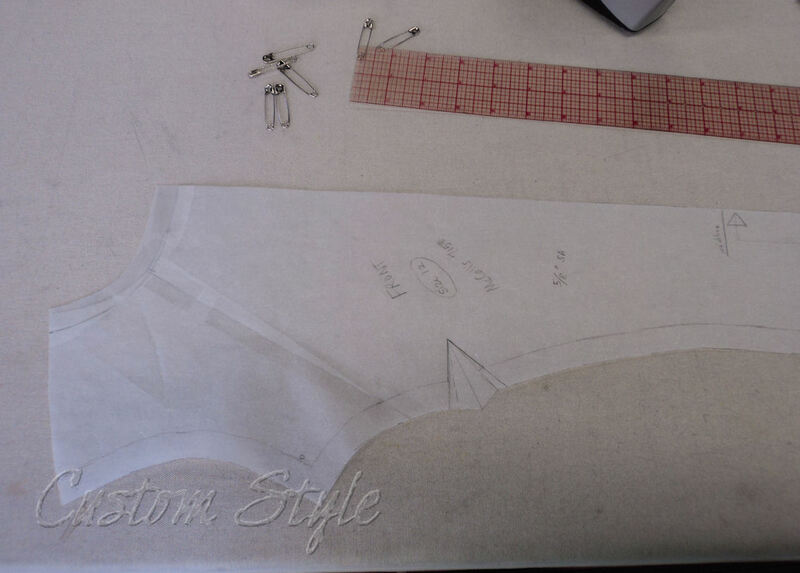 Straight seams stitched on the mockup first. Red thread used for better visual. 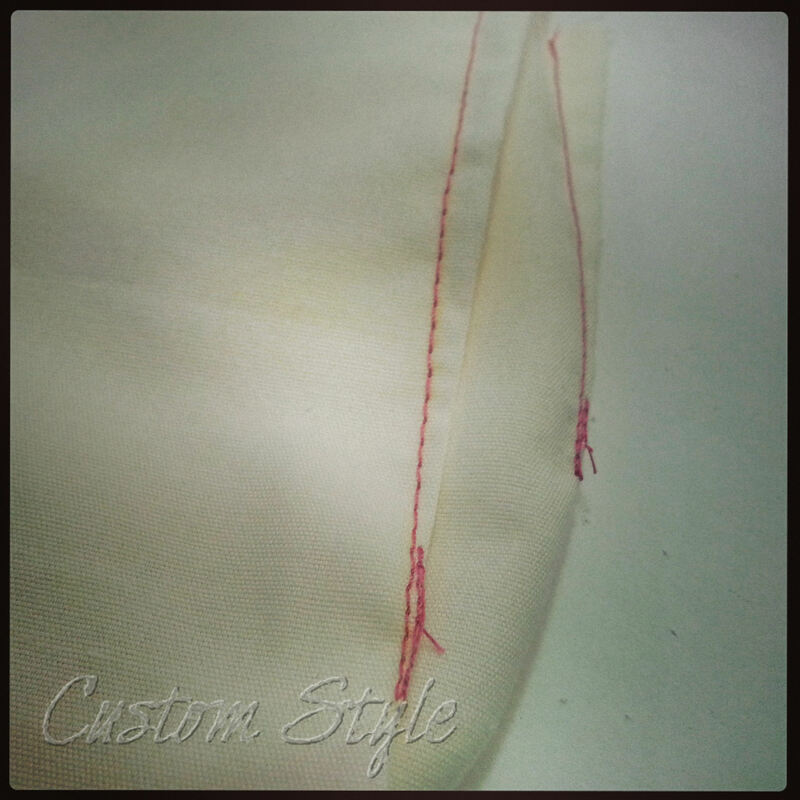 And this is the key to point sewing: Do not try to sew the point as one continuous seam! Treat each point as two separate seams and always start from in the middle at the point. Match points marked with dots. Pin through the dots to match the points. Pinning through the match points. Then pin out from the point for the rest of one edge. Pinned and ready to stitch. 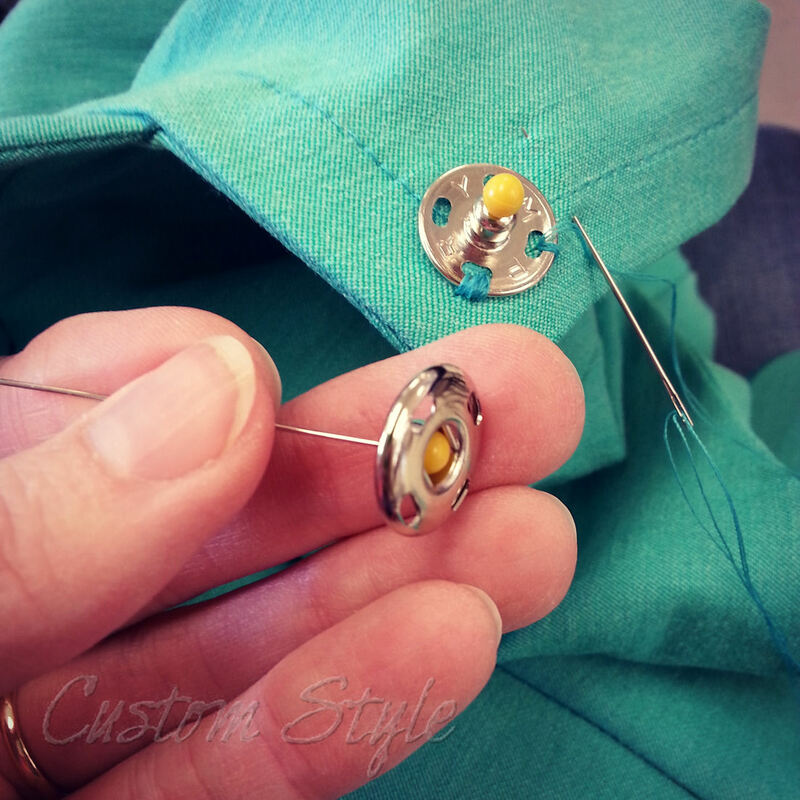 Start sewing right on the dot at the point. 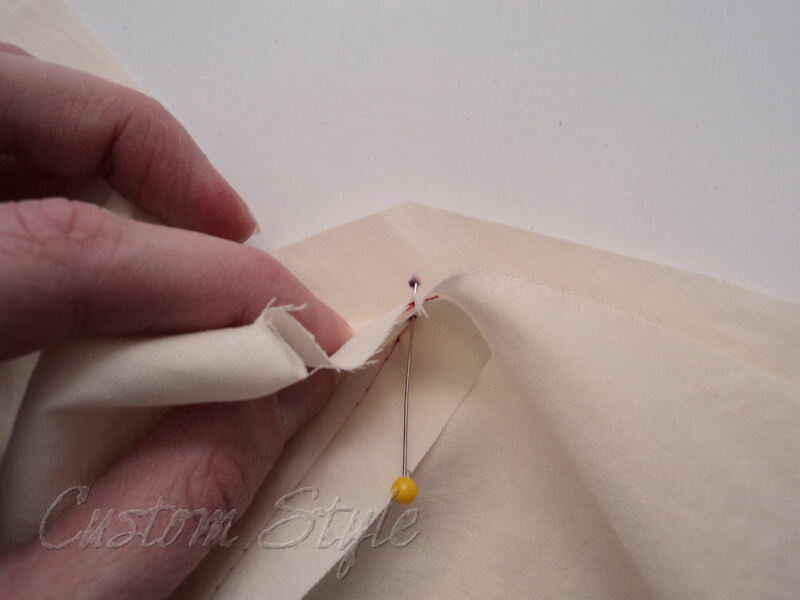 Hand-crank the needle down right on the dot and then remove pin to start sewing the seam. First half of point stitched. 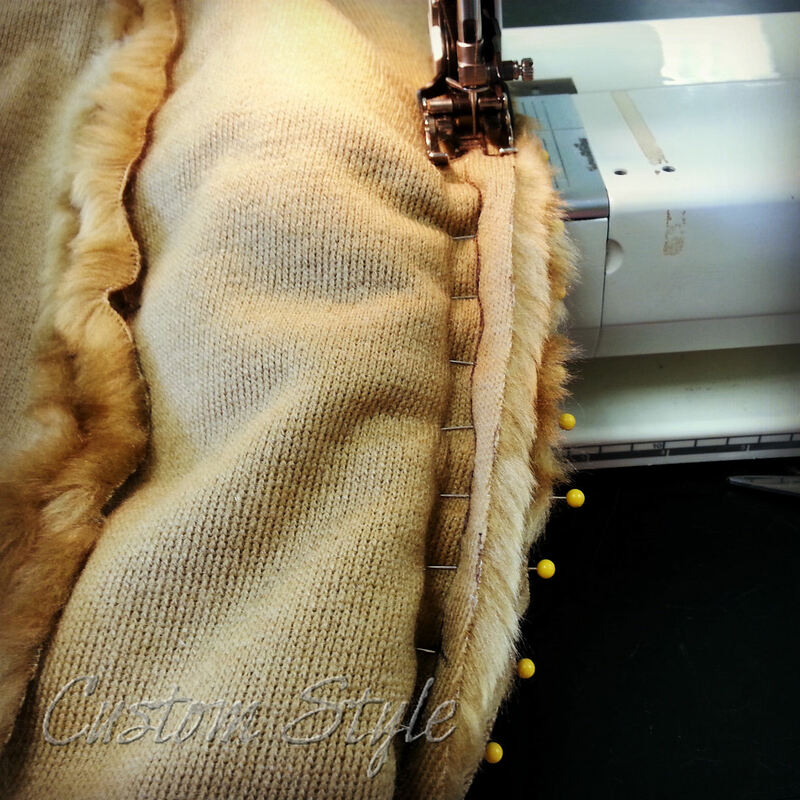 Remove any stitches above the dot on the pressed open seam that was stitched first. 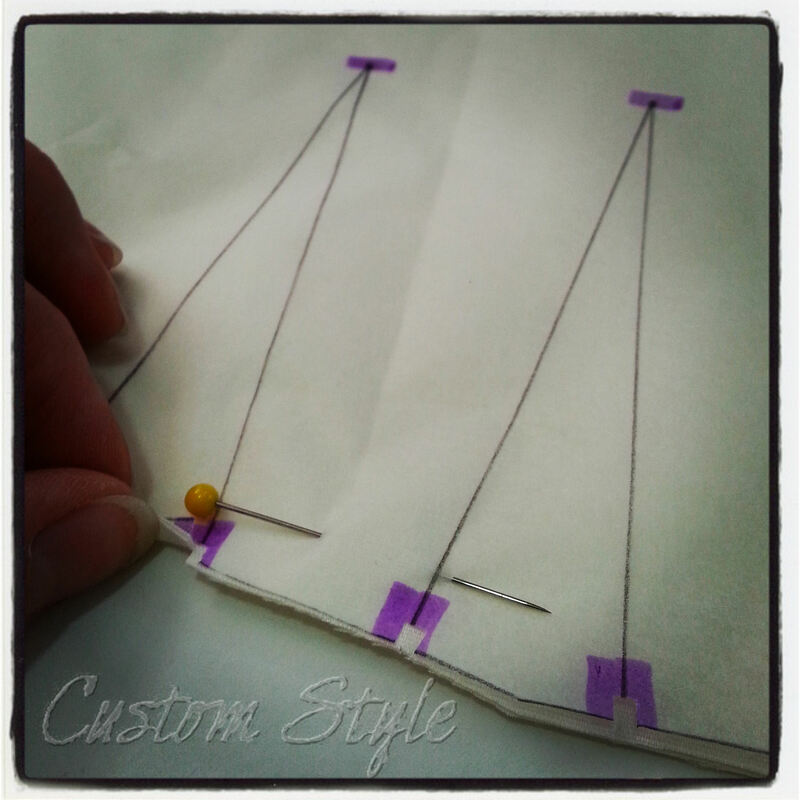 If pattern does not have a seam lining up with the point, clip to dot to spread fabric for pinning to second half of inset point. 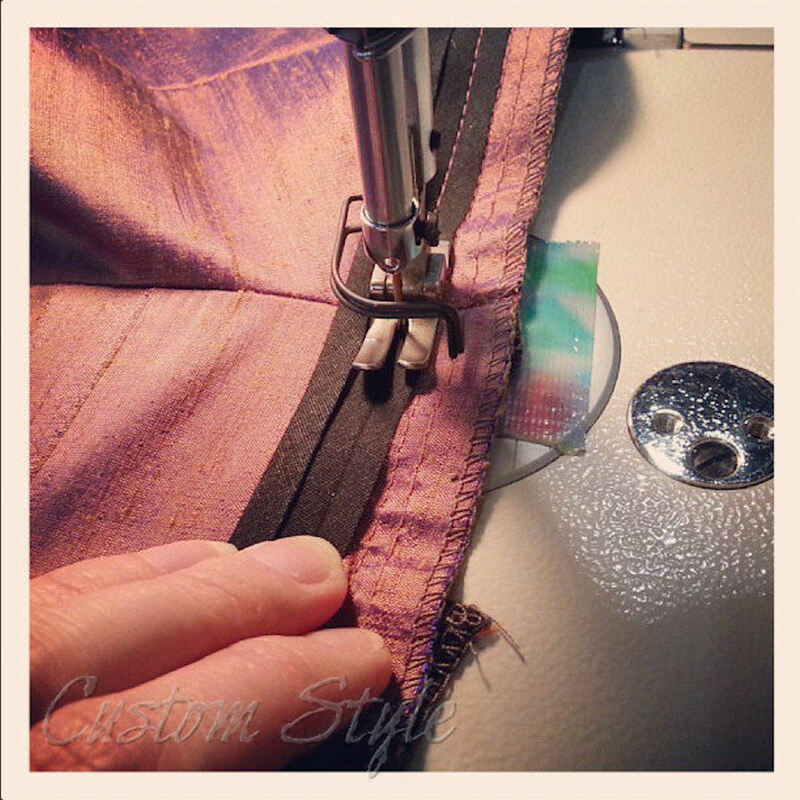 Clip to point, spread, and pin second half of pointed seam. Starting stitch at the point again. Completely stitched point. Wrong sides both front and back. 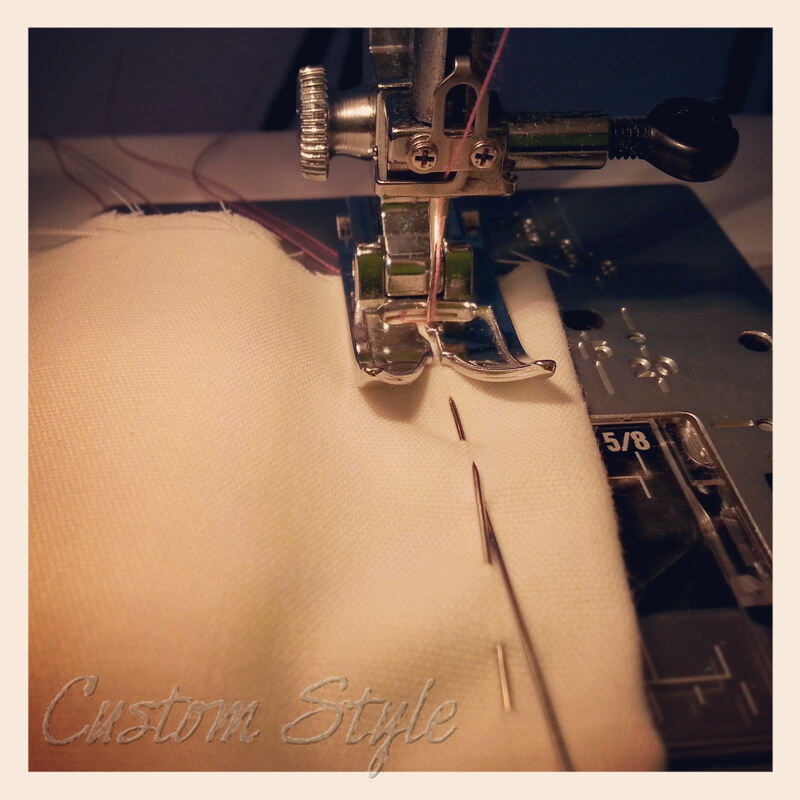 Point sewn and seam allowance pressed down, following direction of point. And there you have it – a nice sharp inset point! The same method also works with more complex shapes like a T-shaped yoke (illustrated in views A & B of this vintage pattern). 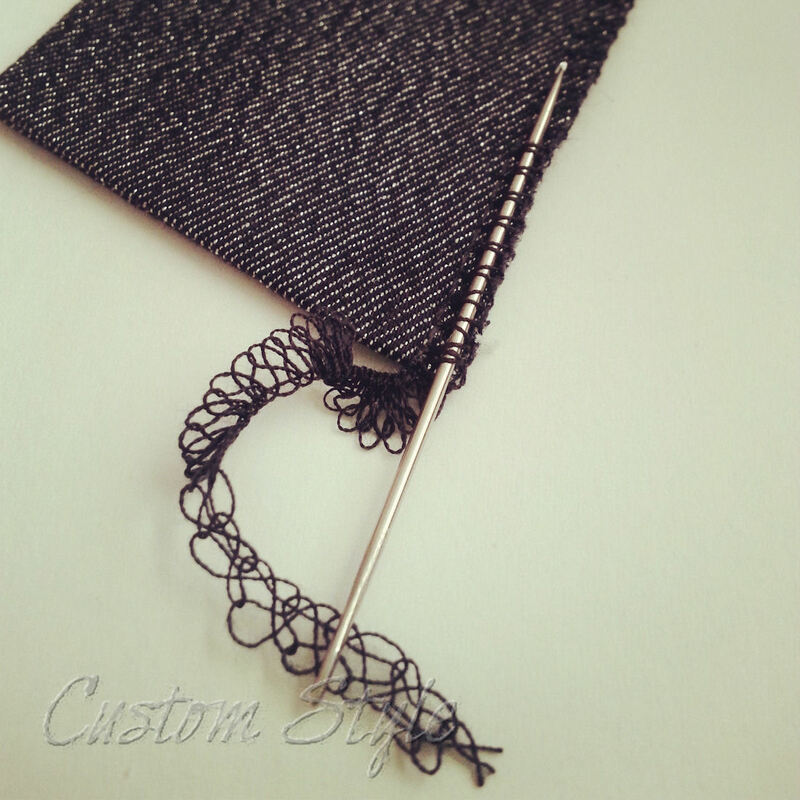 Just start at a point and stitch each edge in separate steps. 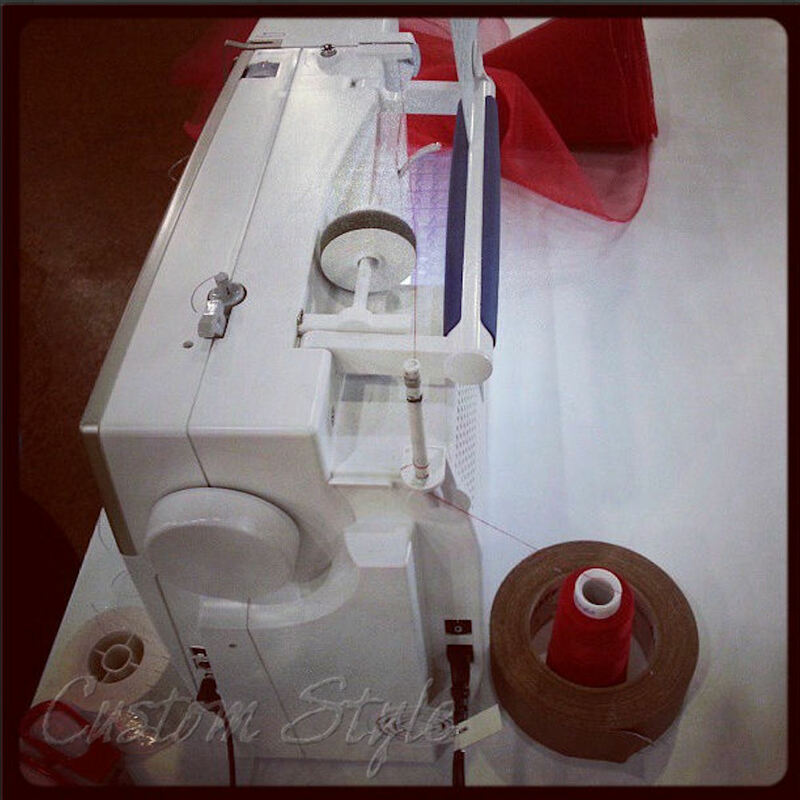 If you ever have a sewing dilemma, feel free to leave a comment, ask me by email or find me on Twitter – I’d love to help out if I can! 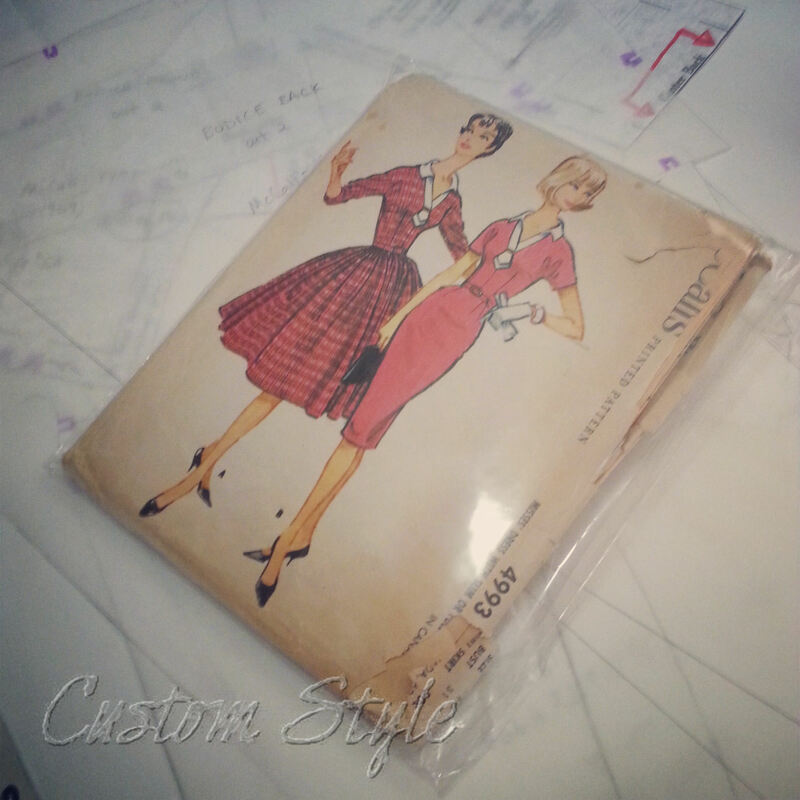 I have always tried to trace sewing patterns – especially if they are vintage patterns! That way I can alter and make design changes without losing the original, and I can keep all the sizes when a pattern is drafted in multiple sizes all nested together. 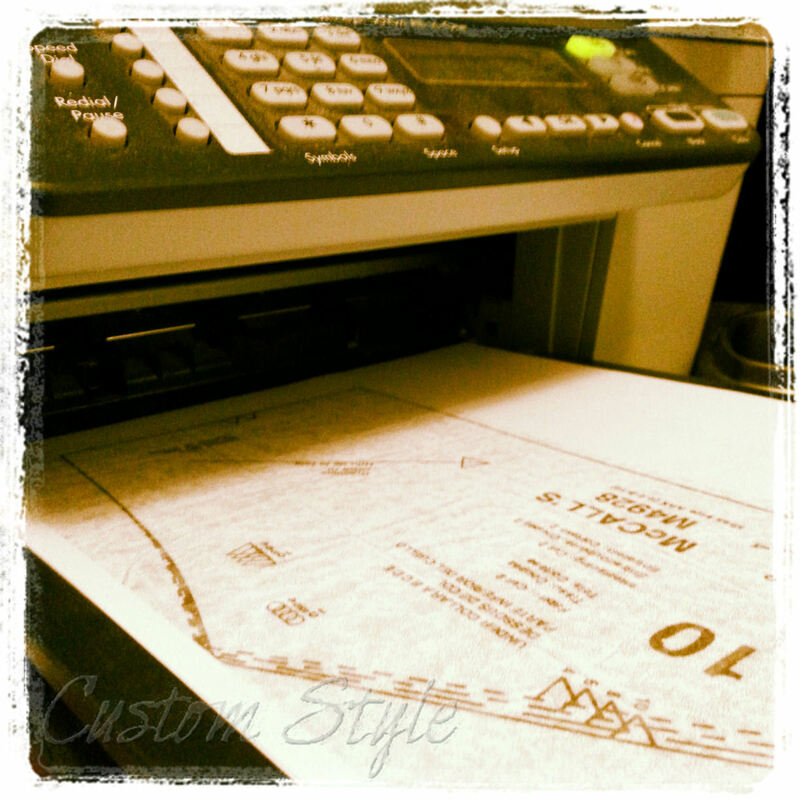 My previous pattern tracing method involved rolls of craft paper (white or brown). 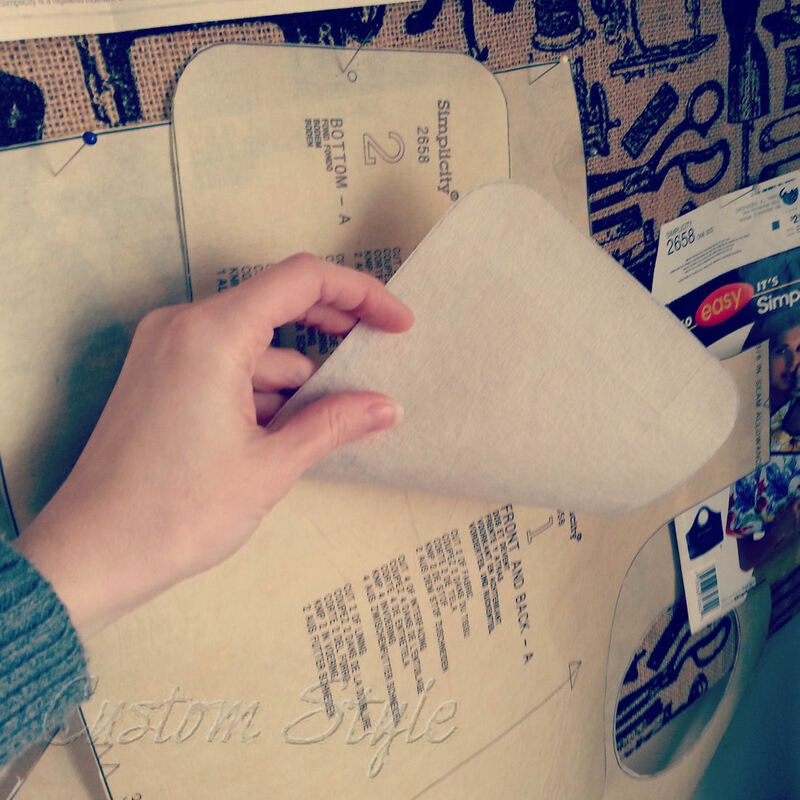 Craft paper is best for pattern drafting from scratch, but it is a pain when you want to trace something because you can’t see through it. 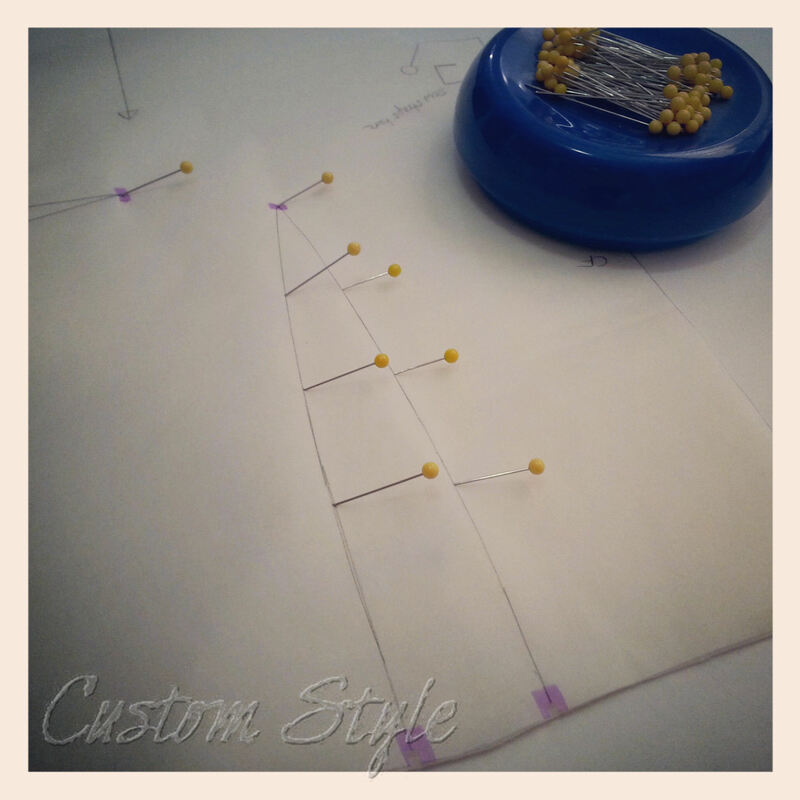 To trace a pattern, I would have to place my pattern on top of the paper and use a tracing wheel to punch little dotted lines into the paper. Then I would need to go back and mark over the dots with a pencil. It was like tracing everything twice and it took for-ev-ER! So I started hunting for a roll of thinner paper that was more see-through. I couldn’t find anything sheer enough in wide widths in my local craft stores. Thus, I began searching online. My search for more affordable tracing paper continued. I’m currently working at The Dallas Opera (helping to build fun 19th century costumes! ), so I was able to have my coworker Traci help me fit my mockup during part of a lunch break. Really convenient since the pattern needed more work than I could easily fit on myself alone! Thanks, Traci! Before: Ick. Just a bad fit all around. After: Lots of pins and Sharpie markings! Mockups aren’t meant to look pretty. They are meant to be drawn all over and pinched and pinned and then cut up. This is why my fabric choice was a cheapy bedsheet – nothing pretty because I knew I would be throwing it away in the end. I never plan to save or use a mockup once it has served its purpose. If the pieces are big enough, I might cut it up and use the fabric for another mockup later (this fabric was actually left over from Camille’s wedding dress mockup). Marked and pinned mockup after fitting. There was a pinch taken out of the neckline to eliminate a gap. Tucks were taken out of the side front pieces for a better fit at the bust. Some of the flare was removed from the skirt. The princess seams were moved inward a bit and the neckline was widened slightly at the edges for a more pleasing shape (these adjustments were mainly made to match a photo of the dress I’m copying). 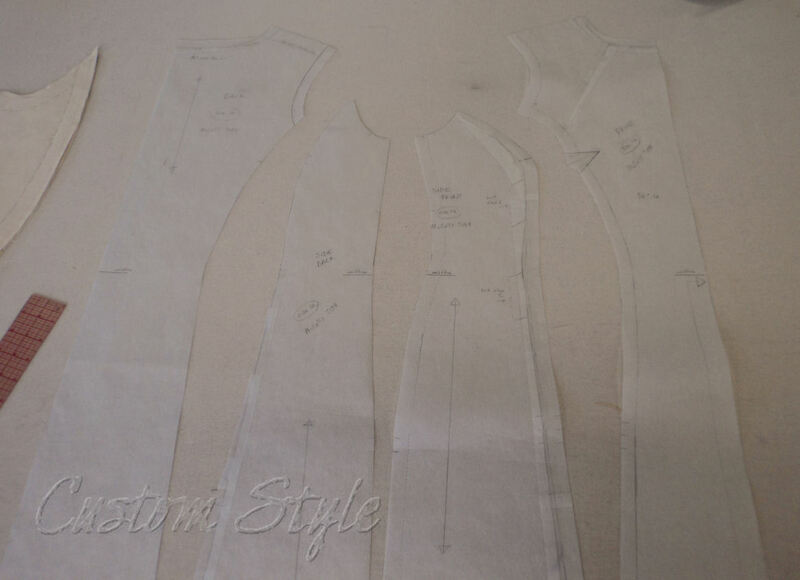 First step was to cut right on the new line for the princess seams in the front, cut off the sleeve following drawn armseye, and rip the stitches out of the shoulder seam – all so the mockup could be opened up and traced onto the paper pattern. Mockup cut on new seamlines. Notice that it was only necessary to mark one side with new lines because I am (for the most part) symmetrical. 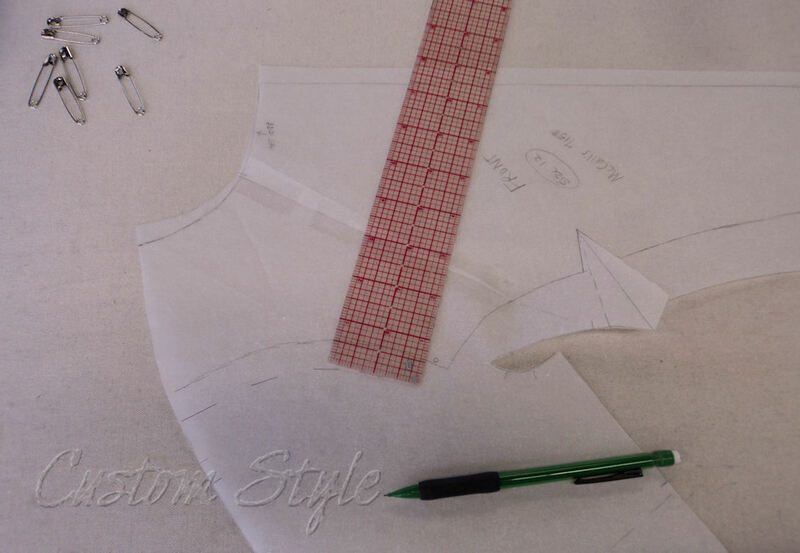 The cut mockup was placed on the center front piece and aligned with the pattern’s top line of the bust dart, shoulder seam, and center front. The new lines were traced onto the paper following the mockup at the neck, armseye, and down to top of dart. 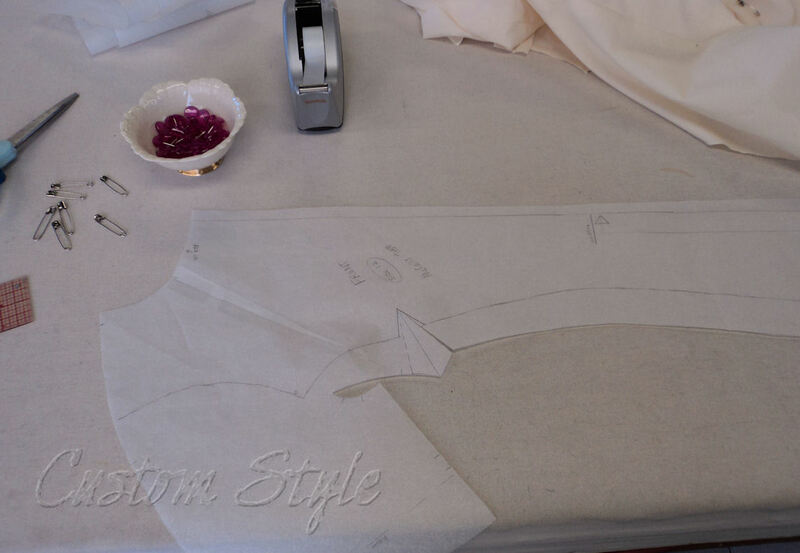 Mockup lined up on pattern for tracing new lines. 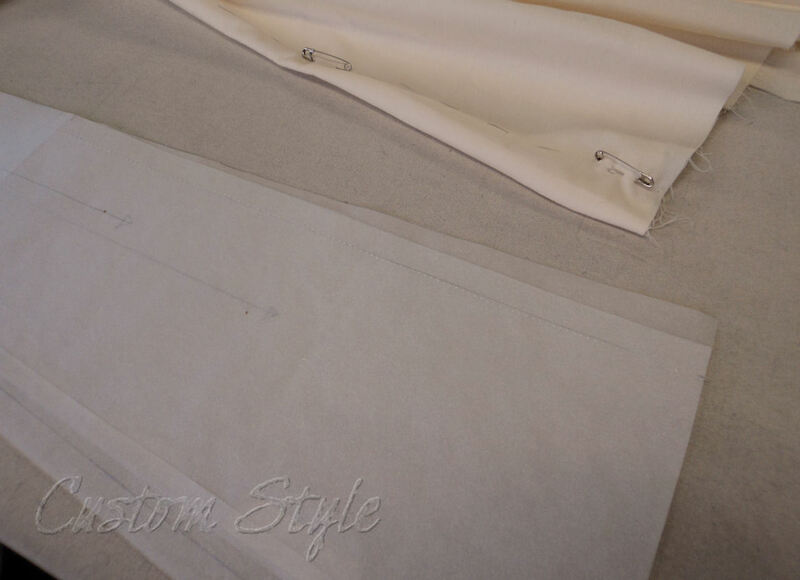 Then the mockup was shifted down to line up with the bottom line of the dart on the pattern and the rest of the new seam was traced. 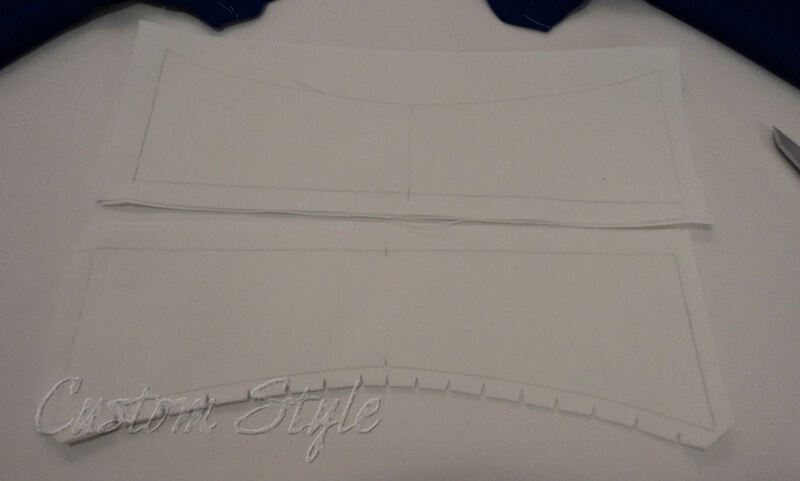 New seamline ready for tracing onto paper pattern. To eliminate the gapping neck in the front, I measured from the top safety pin to the edge of dart. 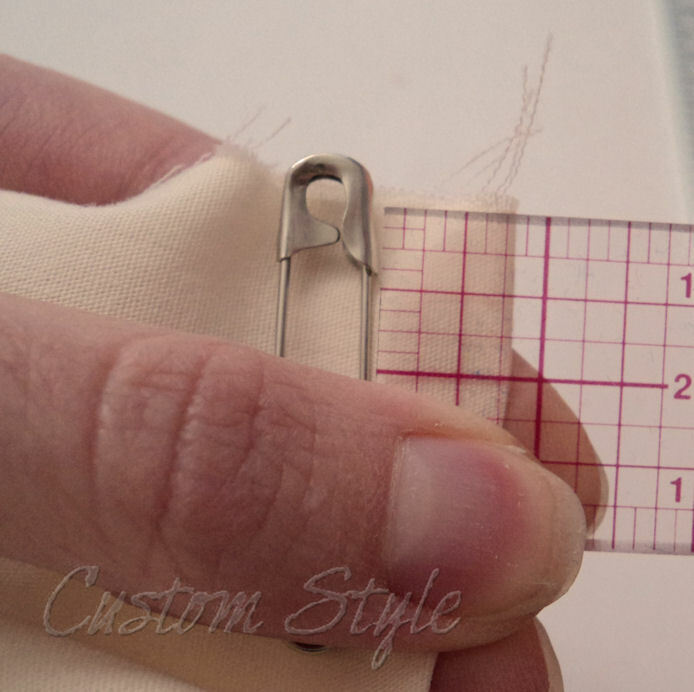 Measuring pinched amount at neckline. I forgot to take one photo at this point (but finished alteration is seen in next couple of pictures). 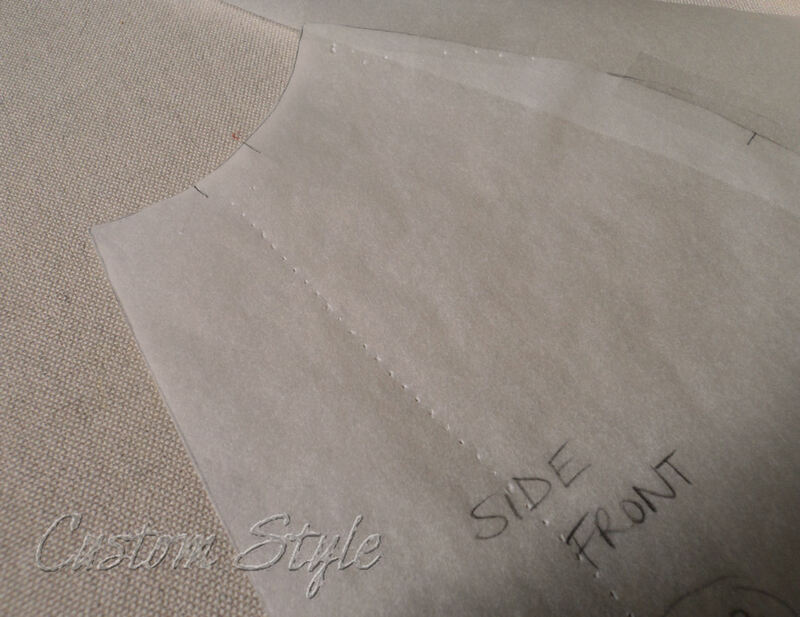 To remove that fabric from the pattern without changing the straight center front line (because it’s cut on a fold), I drew a line perpendicular to the neckline and down to a random point on the side seam. 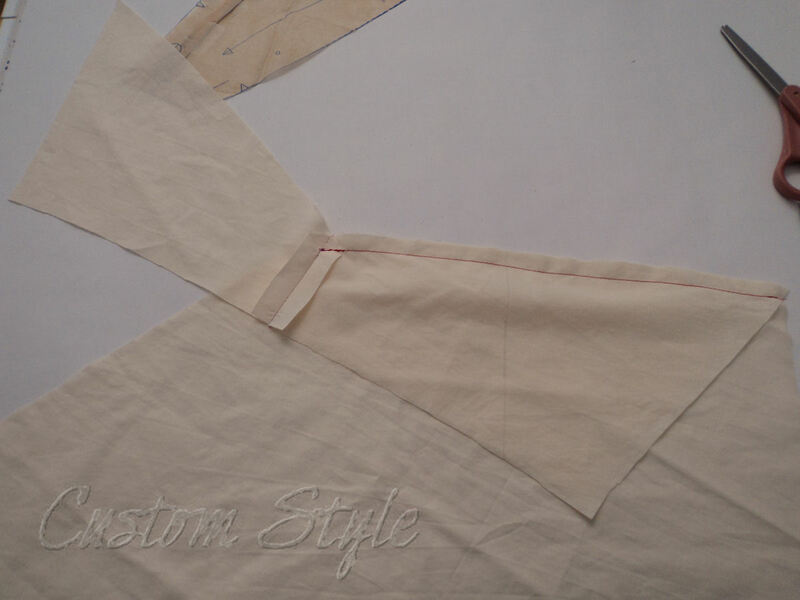 Then the newly drawn line is cut almost all the way down to the side seam – only a tiny point is left attached. And the paper is overlapped the measured amount at the neck (in a V-shape) and taped. Altered pattern piece with all mockup markings transferred. Seam allowances are added following the new seam lines. Final corrected pattern piece including seam allowances. 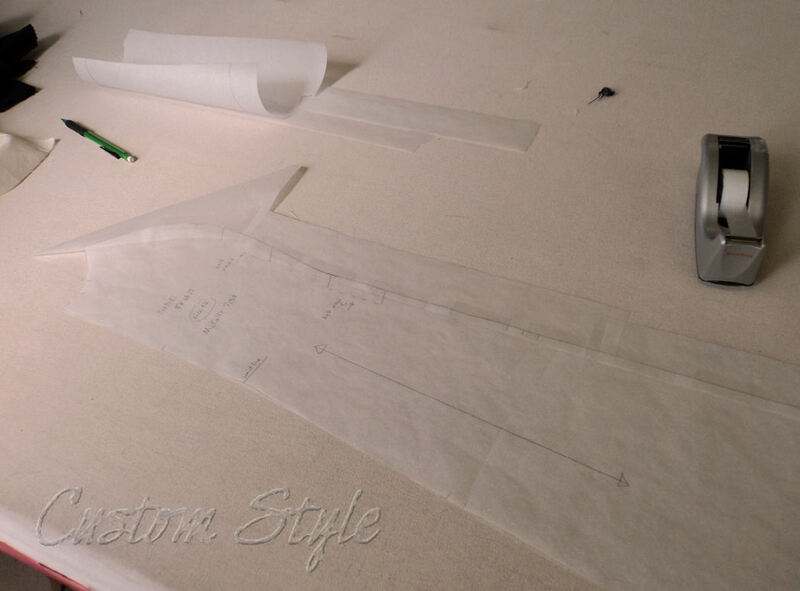 To add the new seamlines on the side front pattern piece, I needed to extend the paper so scraps were taped down the length of pattern. 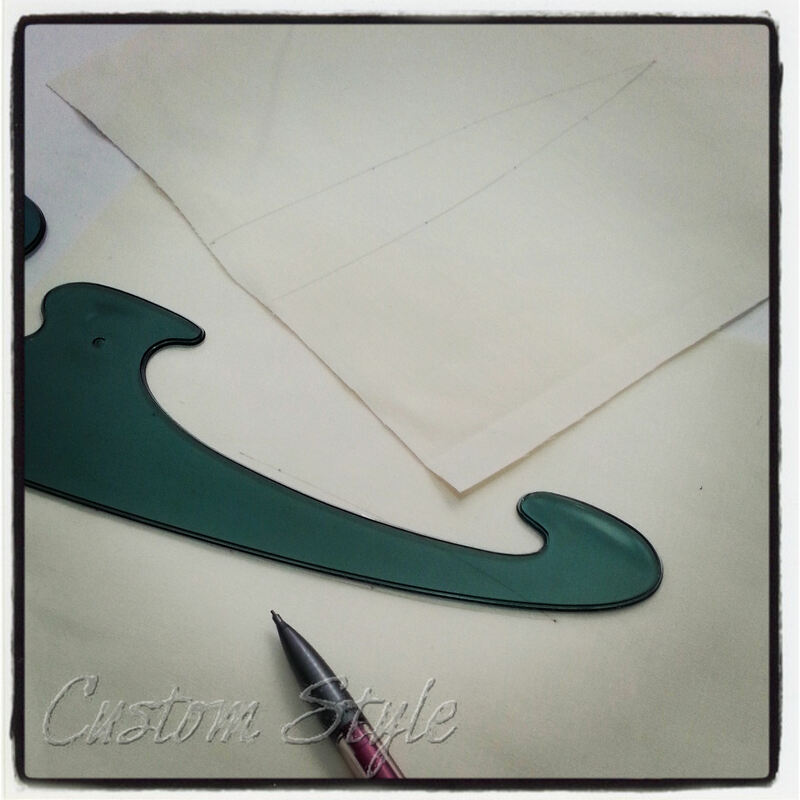 Side front pattern piece with paper added to edge. The mockup was lined up with the paper pattern and pinned down to the table (eventually, I plan to make my cutting table’s surface pinnable too!) and the front edge was traced. 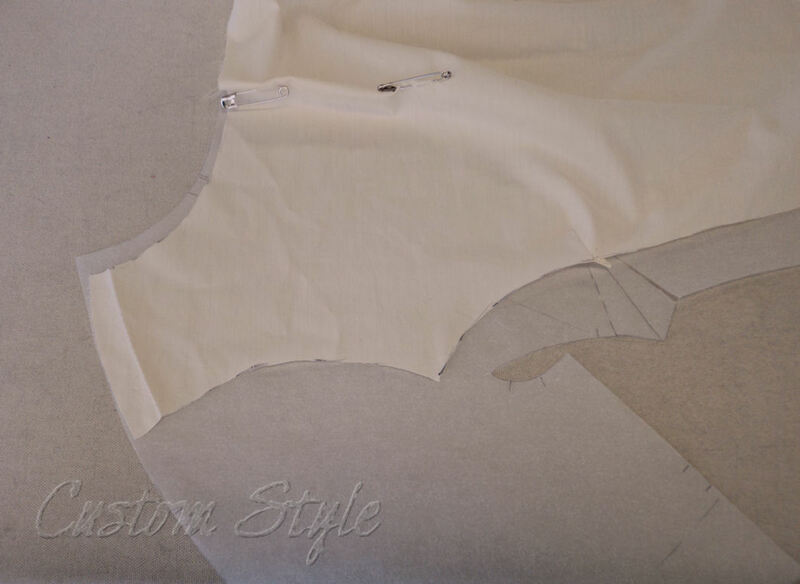 I traced the new side seam (new because of the tuck taken out of the center of the piece) using a tracing wheel, but you can also use a pin to poke a line of holes through the seam and into the paper. 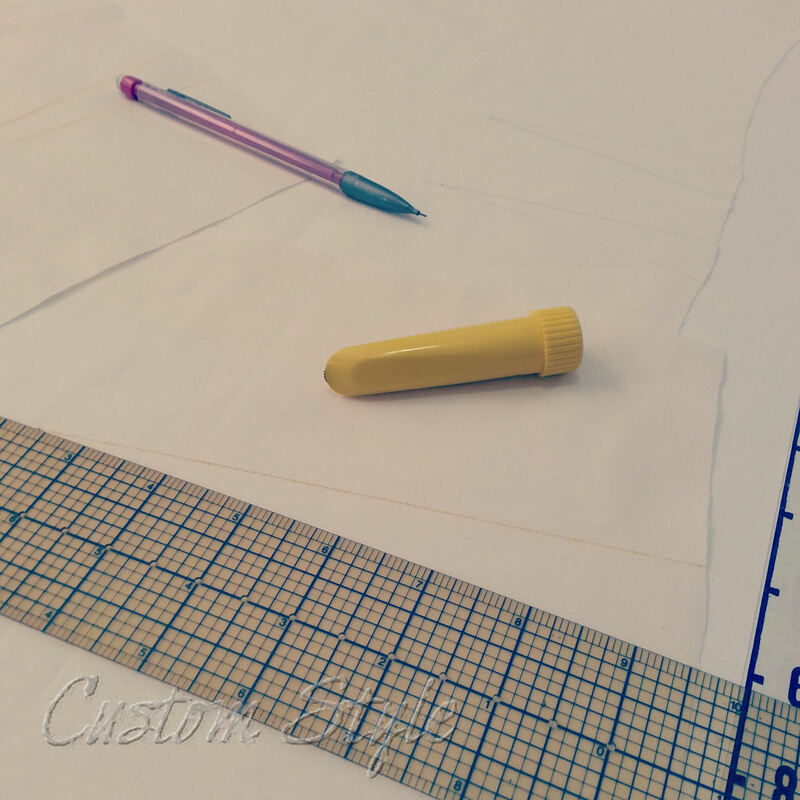 Dotted line on pattern made from tracing the mockup’s side seam with the tracing wheel. Seam allowances were added out from dotted line. 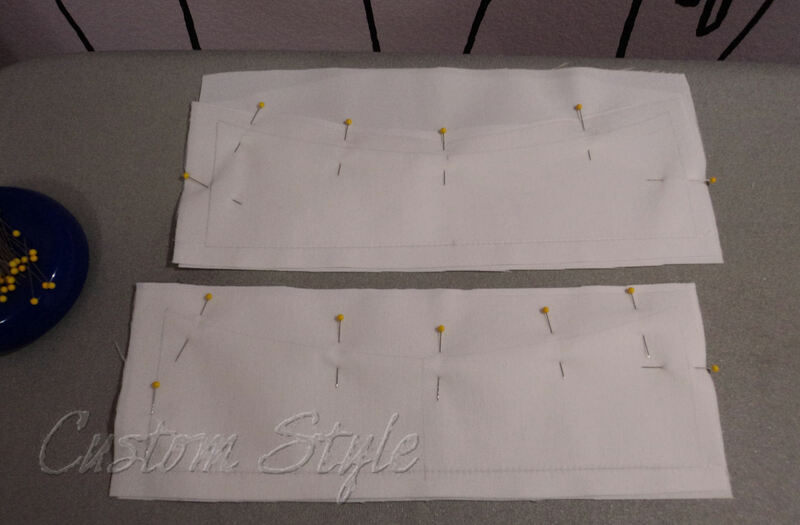 New skirt seam line matched on side front piece using center front pattern piece (seam allowance already included). Corrected pattern with alterations made. That is one strangely curving side front piece – but it hangs straight when it’s on my body! 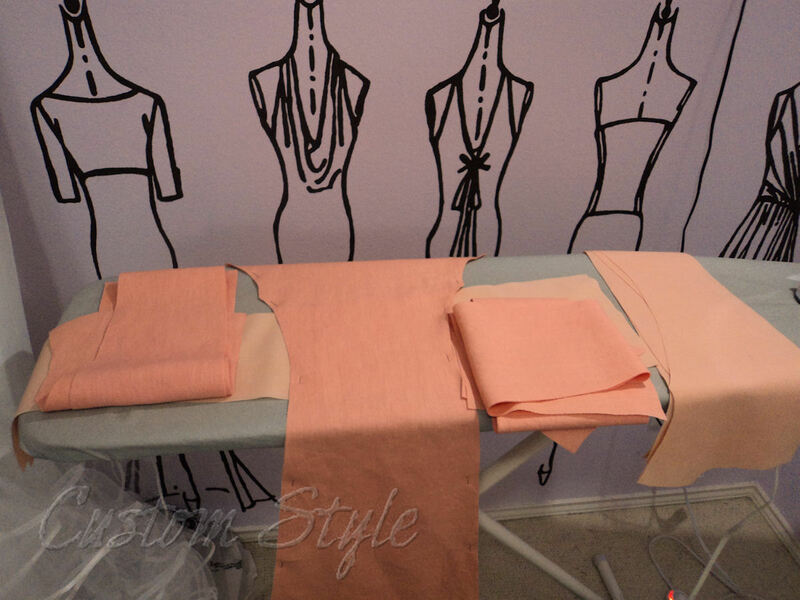 Self-dyed linen in a pale orange – sort of a melon color. 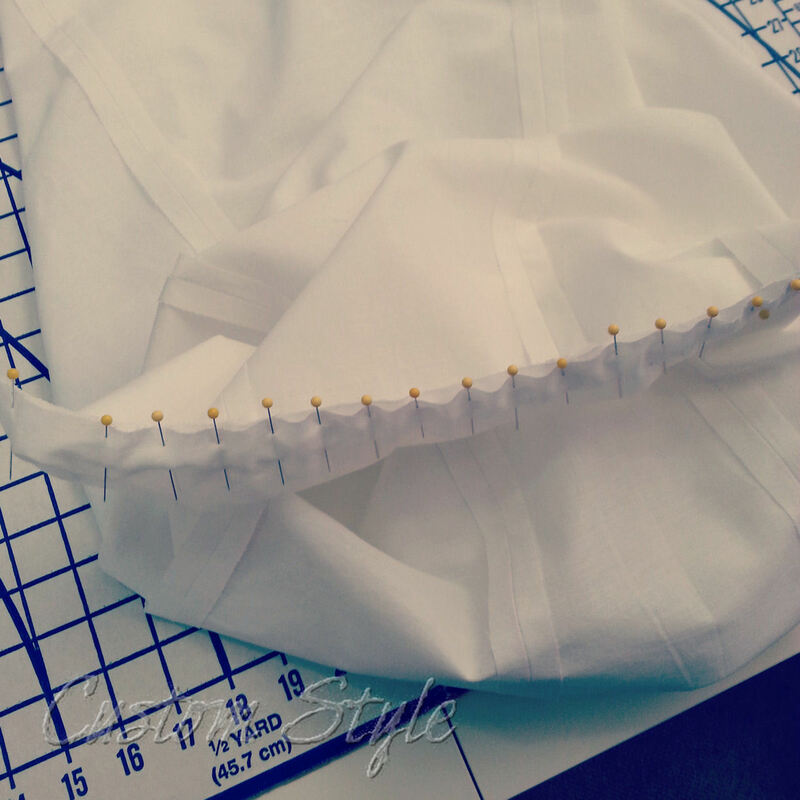 During the uniform madness, I did manage to take a few pictures and mentally note some sewing tips I have for interfacing. 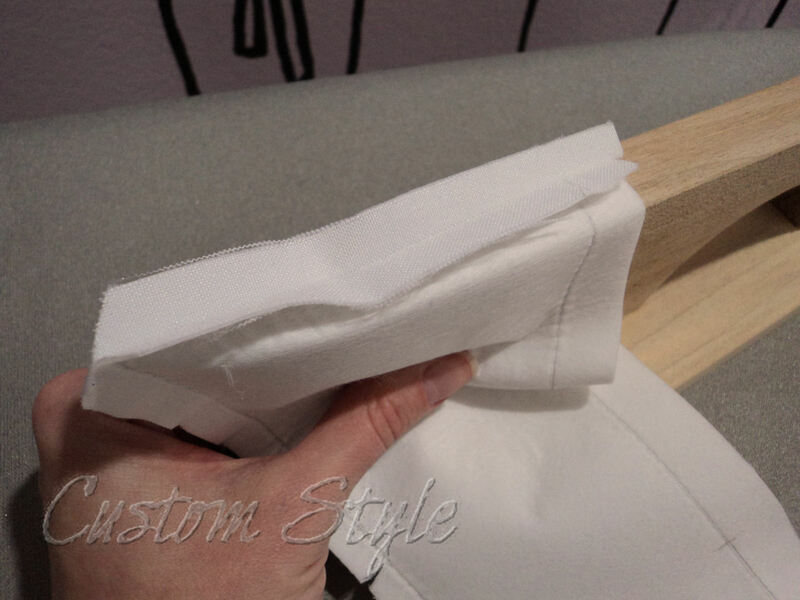 Before I continue with my shortcuts, let me just point out that this is NOT a post about which type of interfacing is best for different types of fabrics. That would require a whole post or two on just that topic and there would still be experimenting required for each individual project. 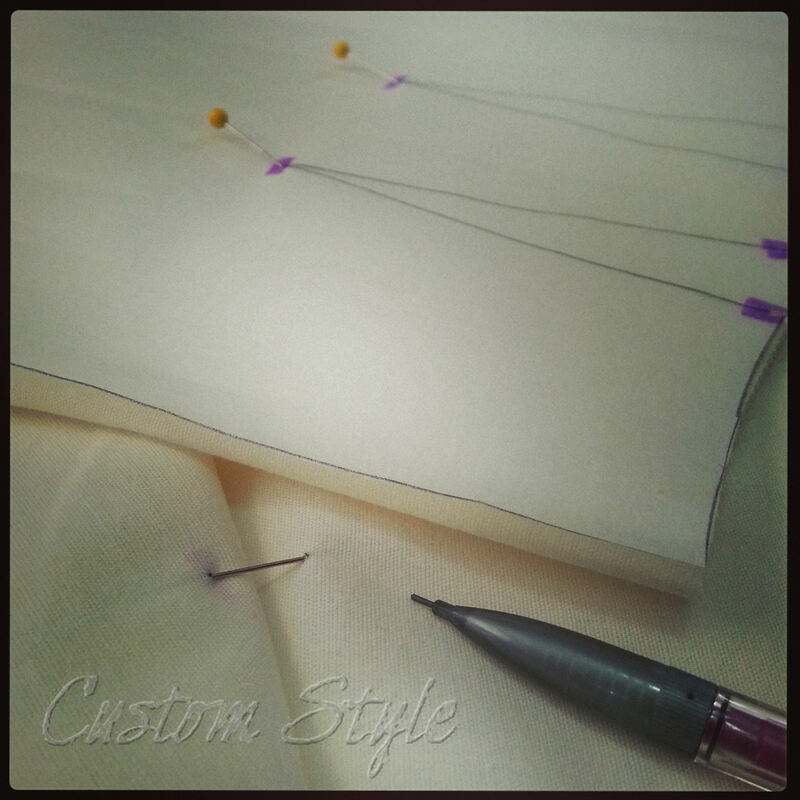 If you really want a good overview and chart about interfacing, my favorite go-to sewing book is Vogue Sewing. It is for sewing what The Joy of Cooking cookbook is for cooking, and includes information about all the sewing basics you would probably ever want to reference. If you want just one sewing reference book on your shelf, it is the one I would recommend. 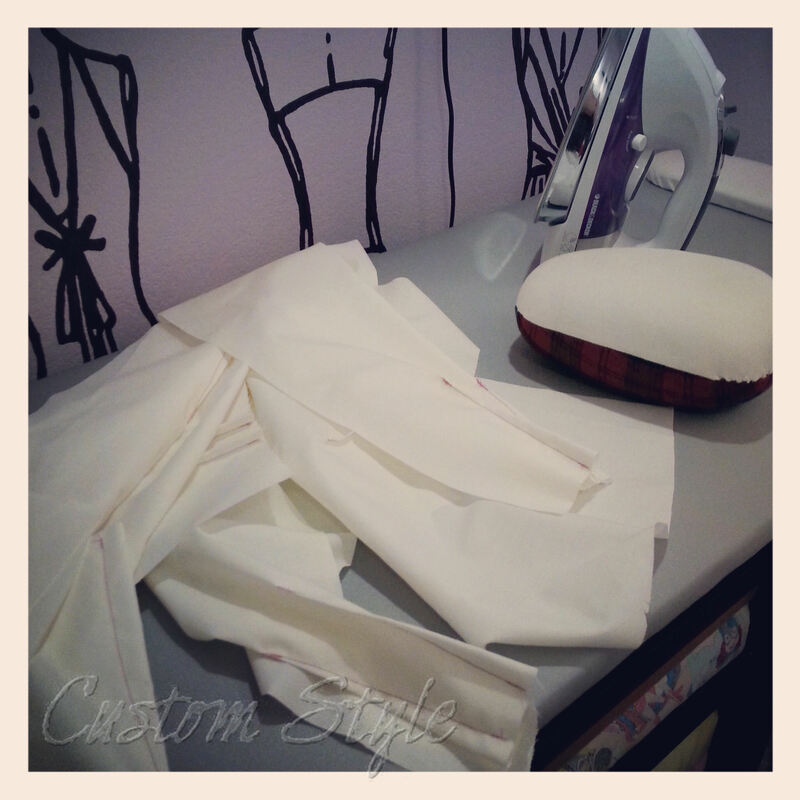 That being said, I do have some interfacing tips, especially if you are making cuffs and collars. 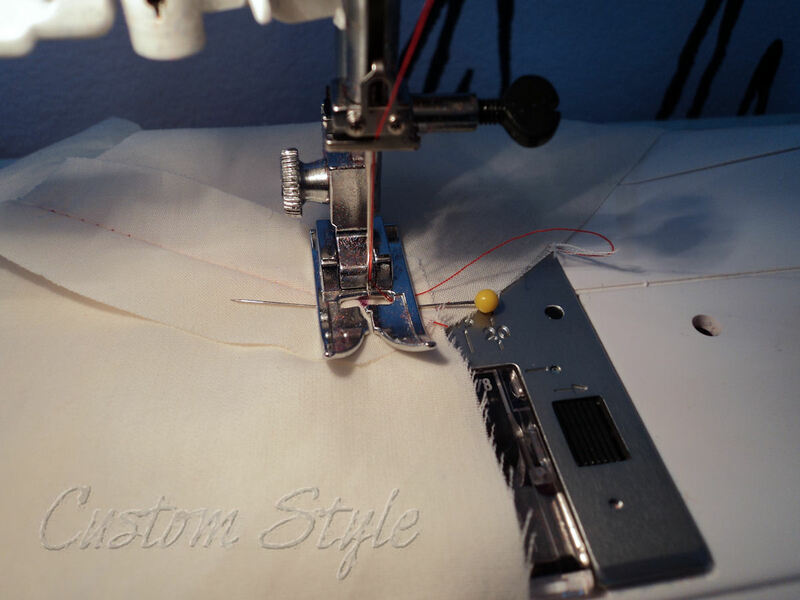 If you’ve ever followed the instructions included with a sewing pattern, you’ve probably cut your fabric and interfacing separately using the pattern pieces. And then, you’ve probably had the fun task of trying to line up the two in order to fuse the pieces together. And the edges of the two layers always shift around don’t they? Super annoying. There are two ways to prevent the shifting and fusing frustration. 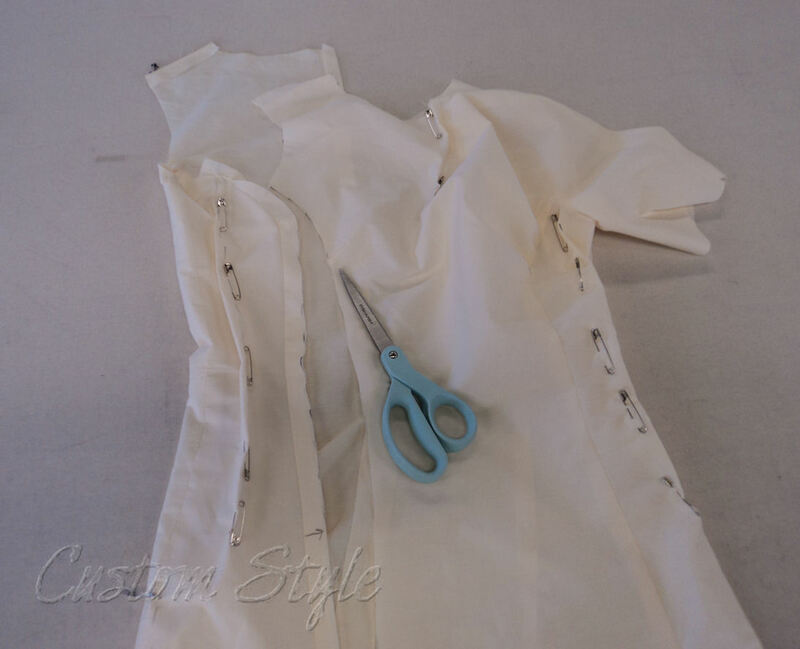 One way is to cut only the interfacing pieces using your pattern. 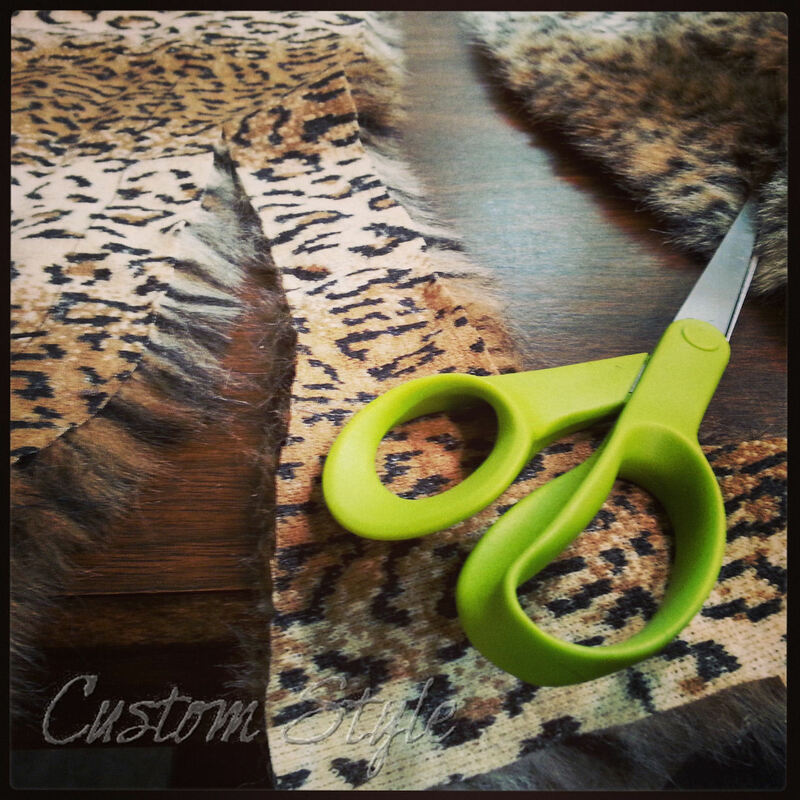 Then you fuse those to your yardage of fabric and then cut your fabric around the fused interfacing. 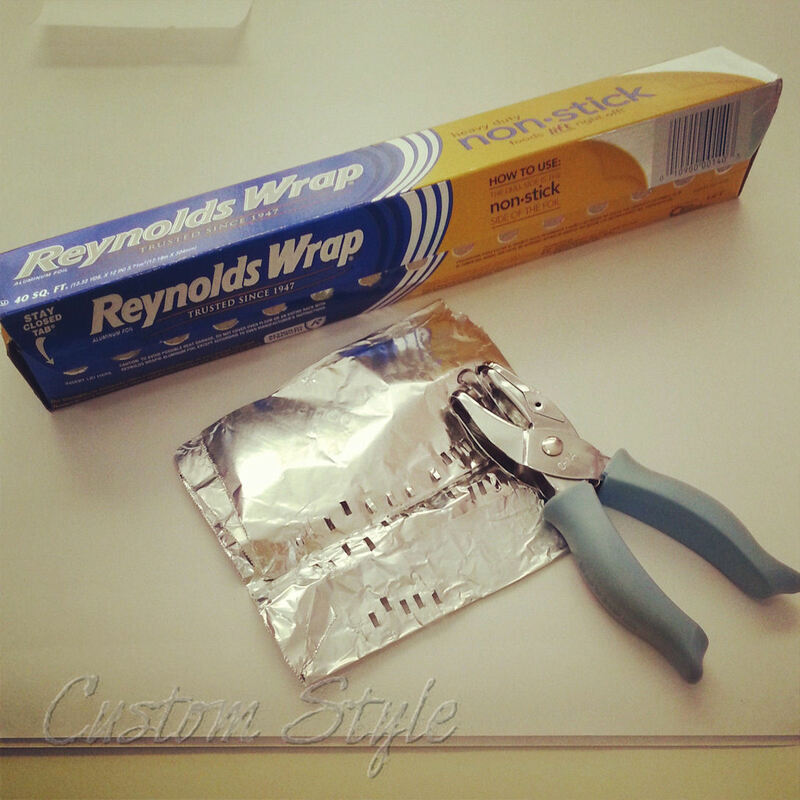 This works best with the non-woven or non-knit interfacings because they hold their cut shape better. 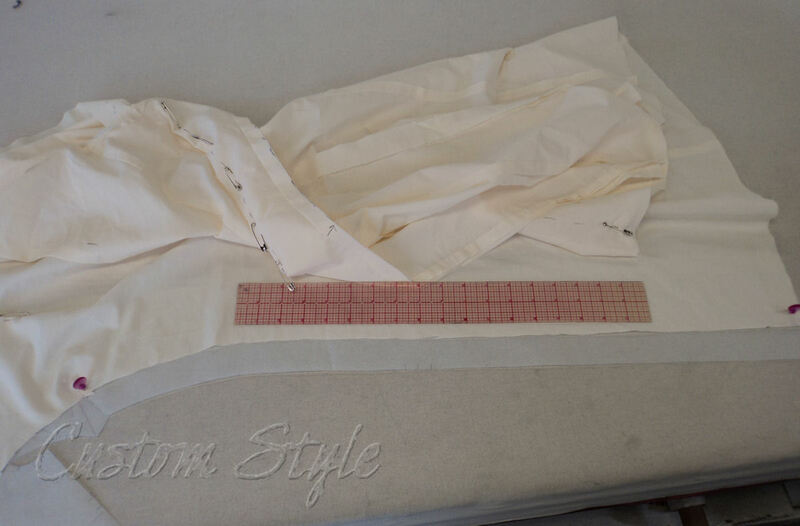 The second way is to block-fuse (or pre-fuse) large strips of interfacing to your fabric before cutting either of them with your pattern, essentially creating a large piece of backed fabric. 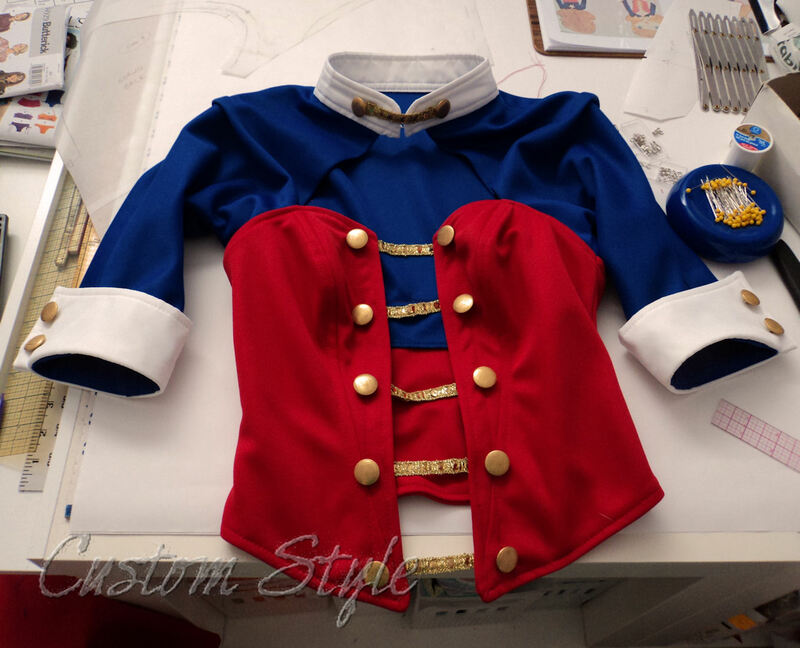 I had 11 collars and 22 cuffs to make for the cheer uniforms, so I took it one step further. 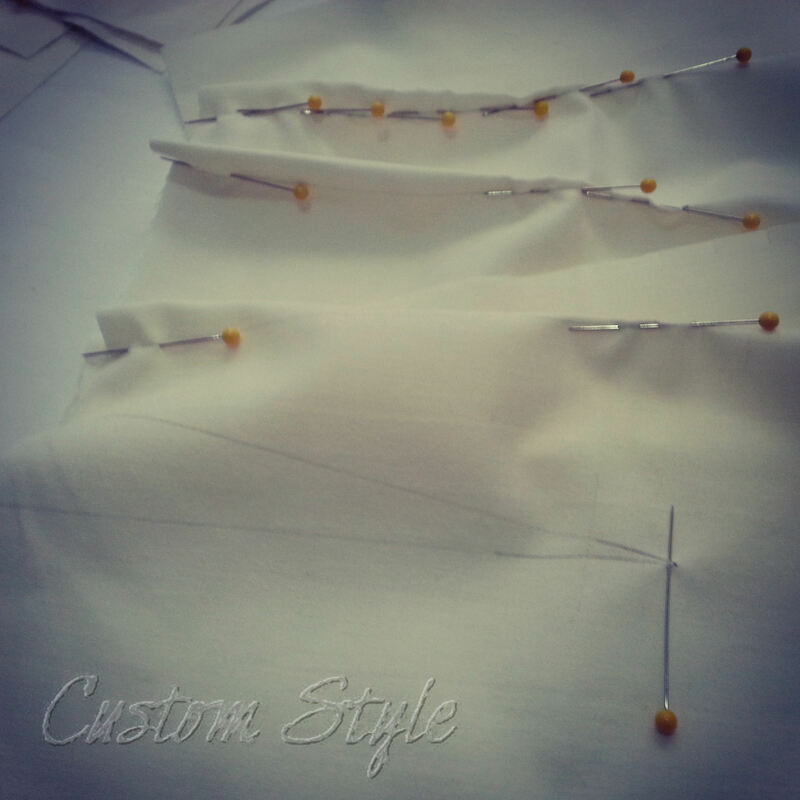 Not only did I block-fuse my interfacing, I traced my cuffs and collar pieces directly onto the interfacing using a pencil. 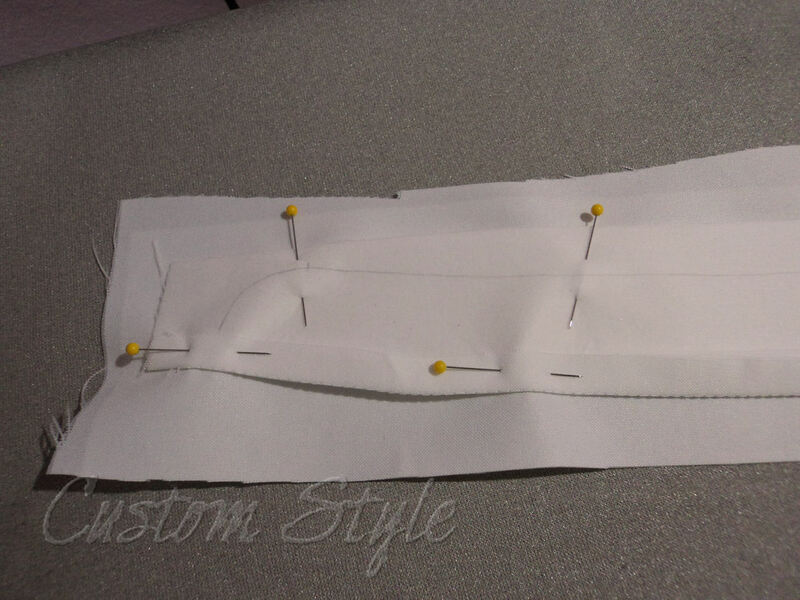 I did not include seam allowance on my pattern pieces, so the pencil line was my actual stitch line. 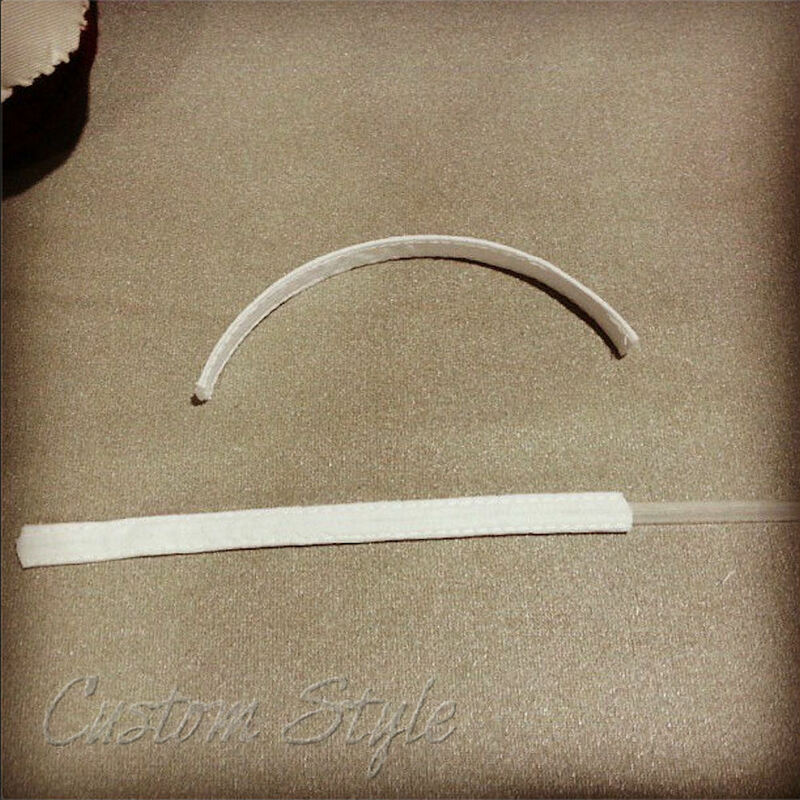 This meant I was able to rough cut my pieces without measuring any seam allowances and then stitch directly on my pencil lines. 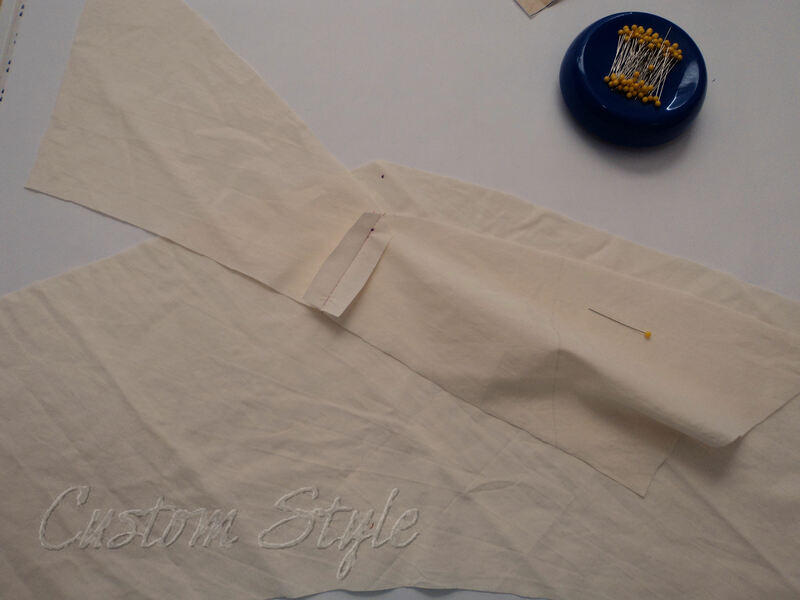 Cuffs were traced on the pre-fused interfacing and then roughly cut out and pinned back to back with another unmarked piece of pre-interfaced fabric. 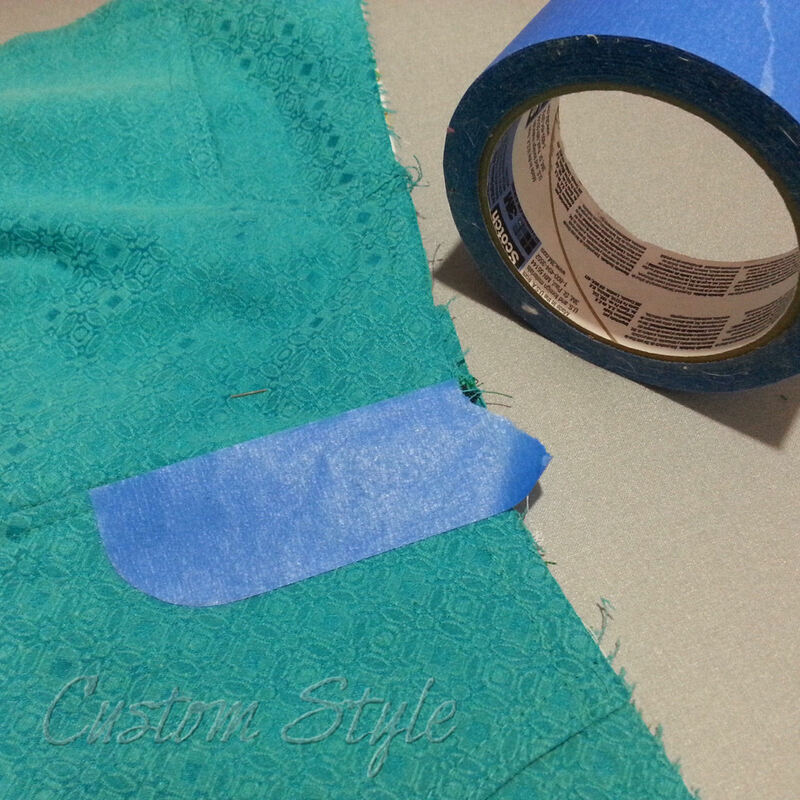 After stitching, I trimmed my seam allowances down and clipped the curves. This was the first curve I clipped and I was so tired that I goofed – I didn’t need to cut V’s around a curve going this direction. I made the others by just cutting single clips once I realized my mistake. Then I ironed all my seams open with the help of my point presser with clapper to make turning easier and to insure crisp edges. 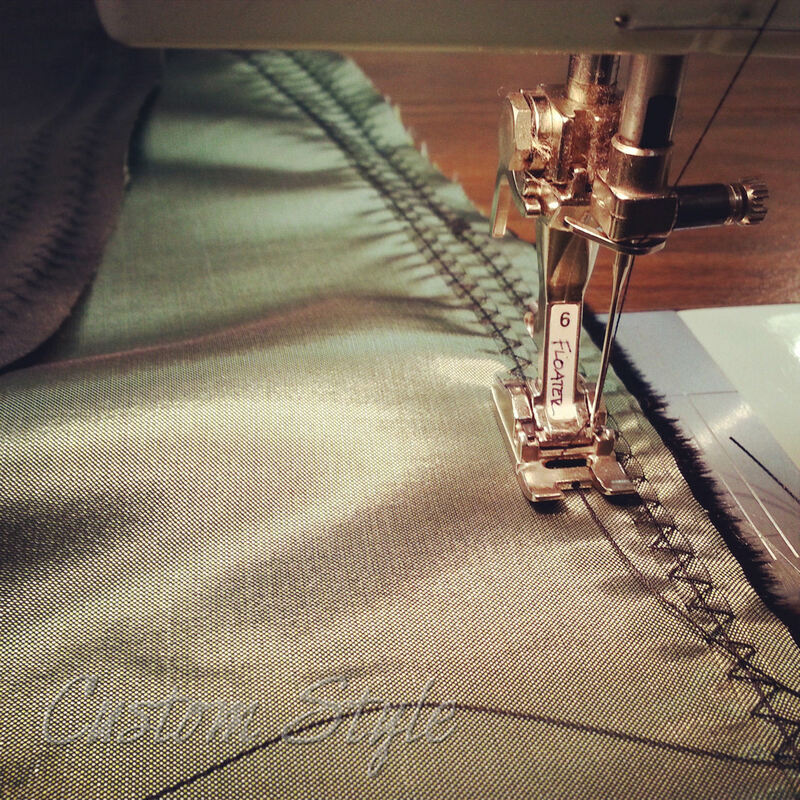 Ironing seams open with the point presser. 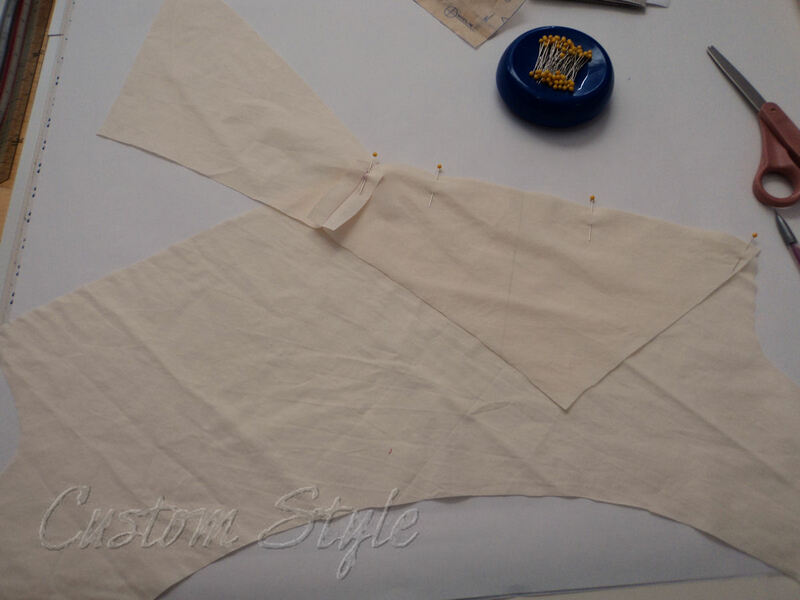 Before stitching the front to the back, I basted the bottom edge of the collar on the stitchline and pressed it up. 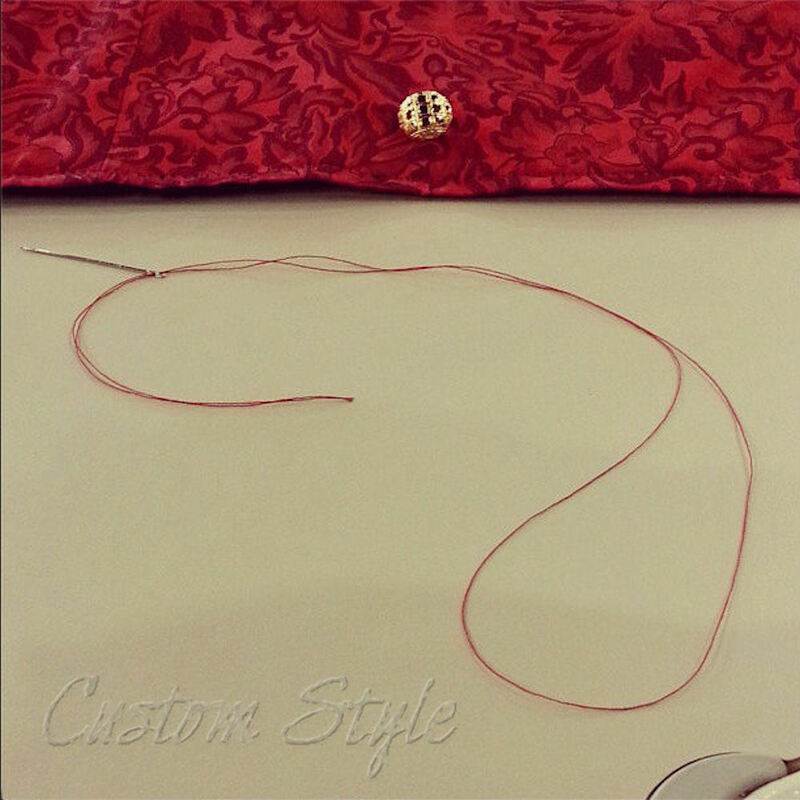 This makes it easier to attach to the neckline later because one half is already neatly turned inward. before both layers are stitched together. 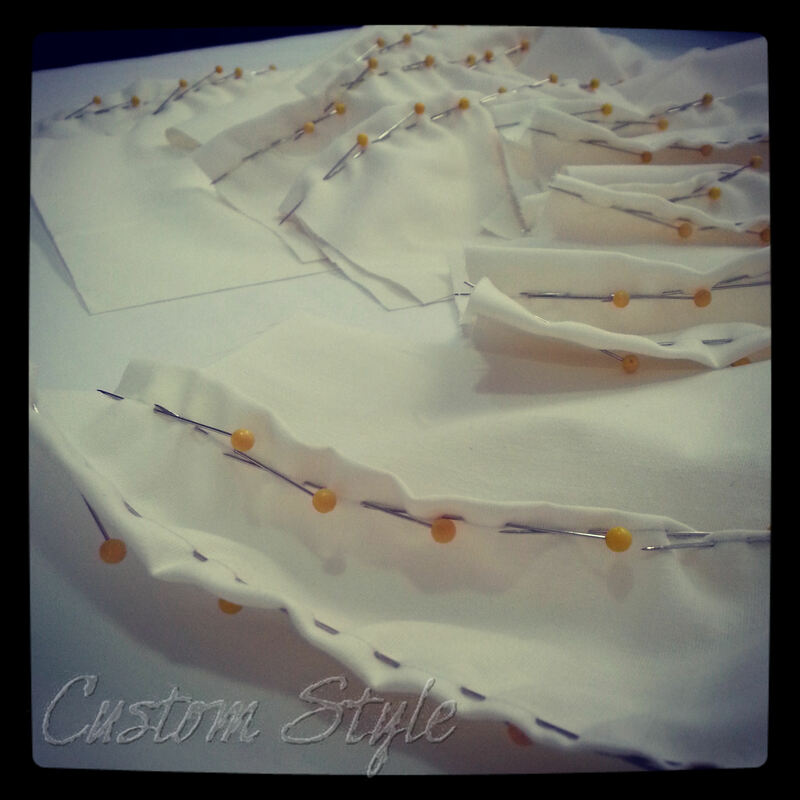 And after I made my pile of cuffs and collars (oops! forgot to take a photo of the pile), I was able to attach them to all the uniforms. One uniform top with cuffs & collar attached.